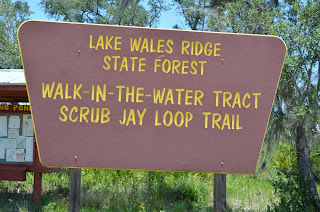 This was our third trip to the Lake Wales Ridge area. 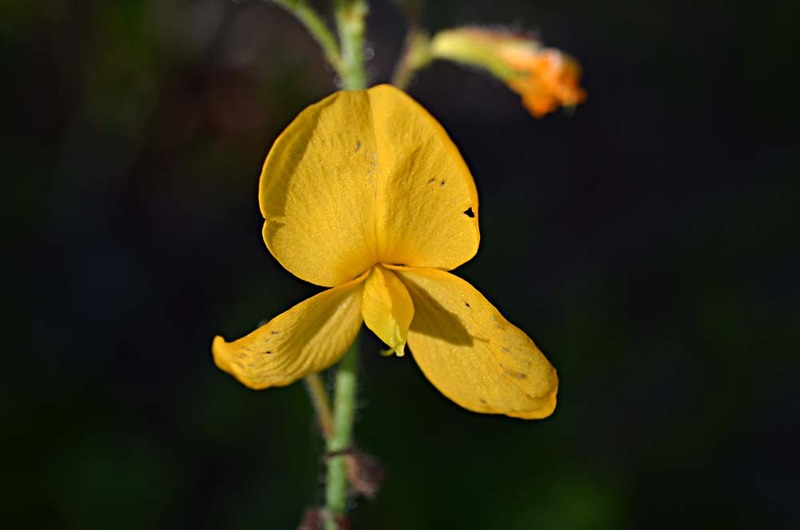 Found no new species, but I did get to try out my new camera, a Nikon 5100 SLR with a tiltable monitor screen and a 40mm macro lens. 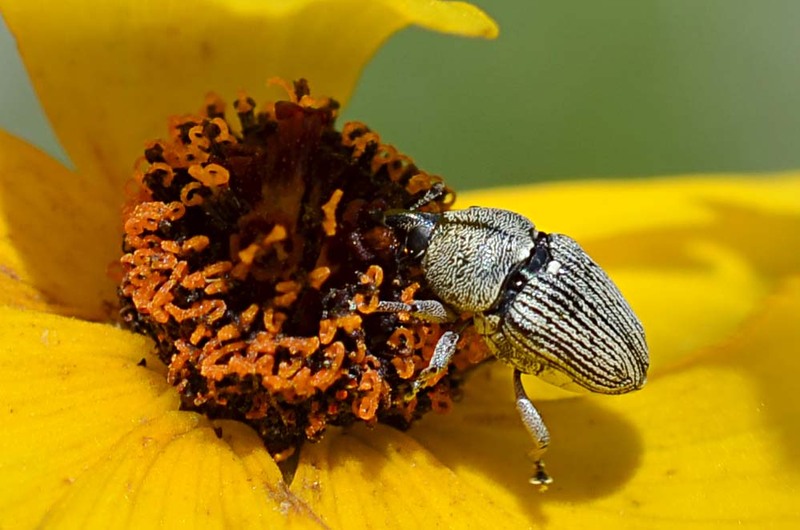 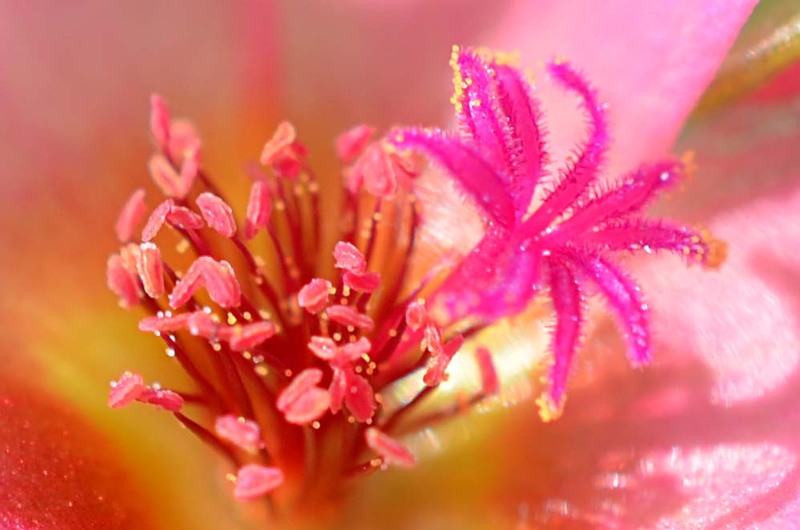 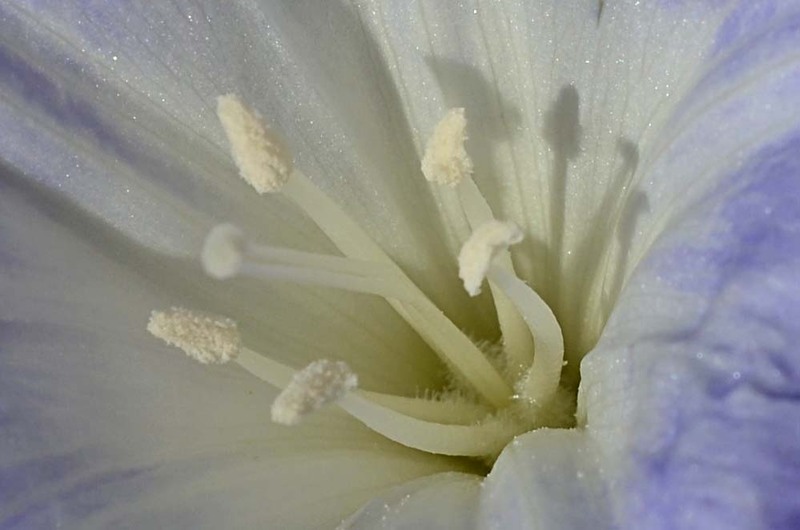 I show off the macro lens in several extreme close-ups in this post. 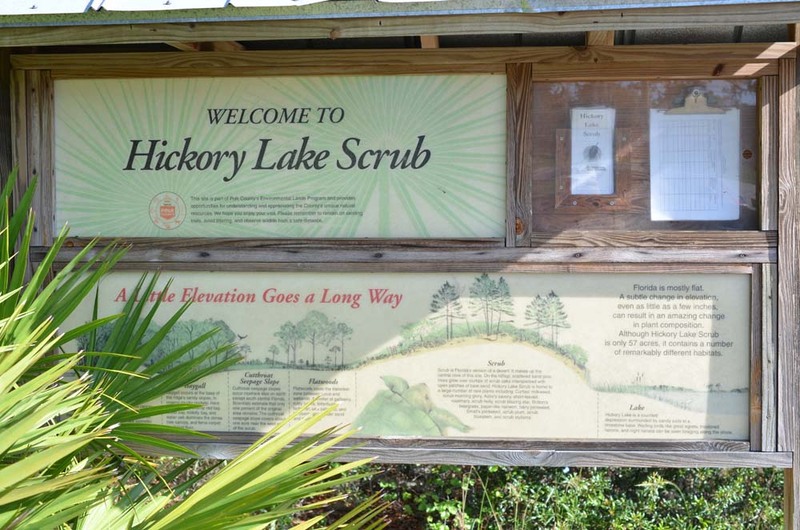 Stop #1. 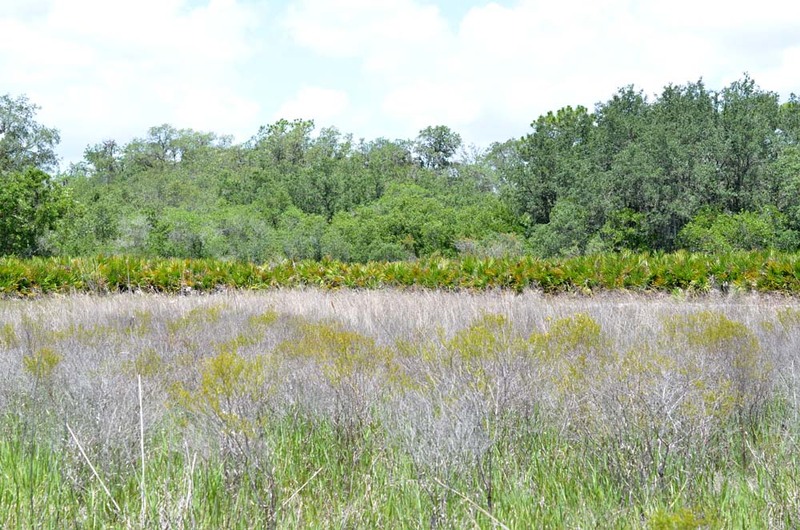 A quick stop at boat ramp on SR 60 at the Kissimmee River. 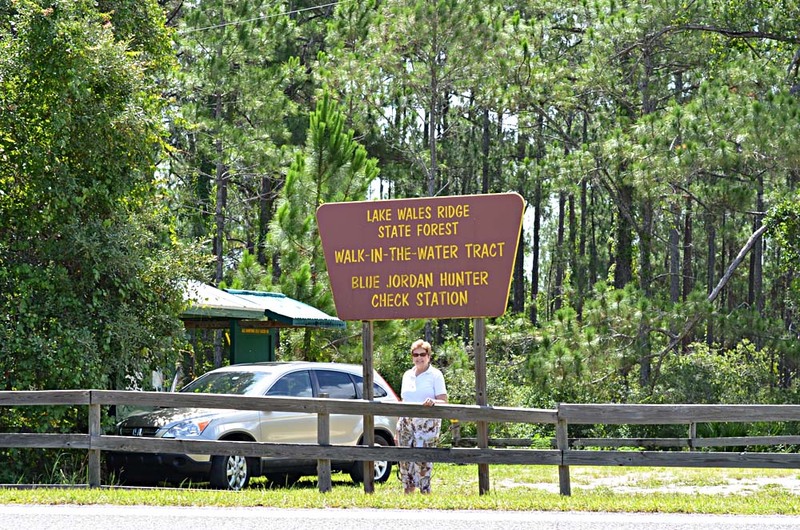 Our first Lake Wales Ridge stop was at the Walk-in-the-Water Tract, Blue Jordan Hunter Check Station on Lake Walk-in-the-Water Road, between SR 630 and SR 6. 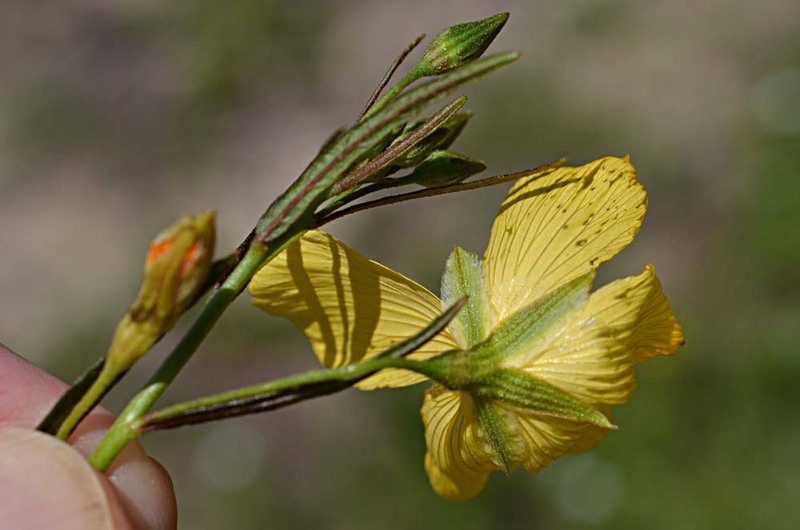 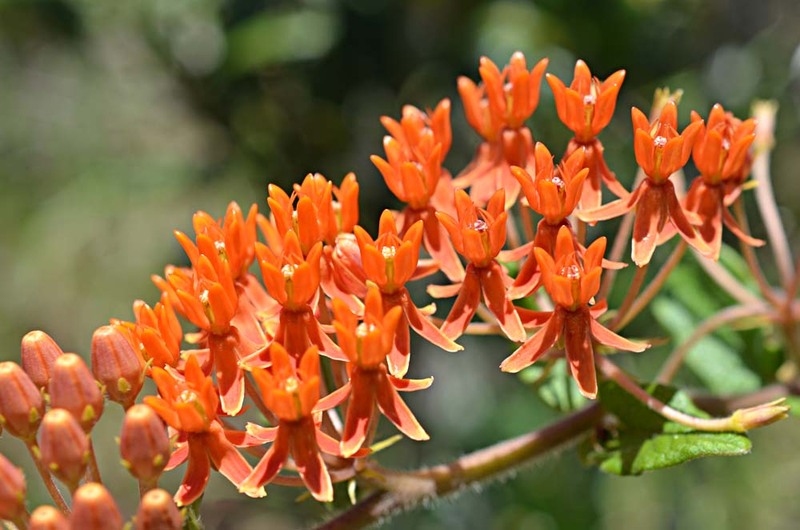 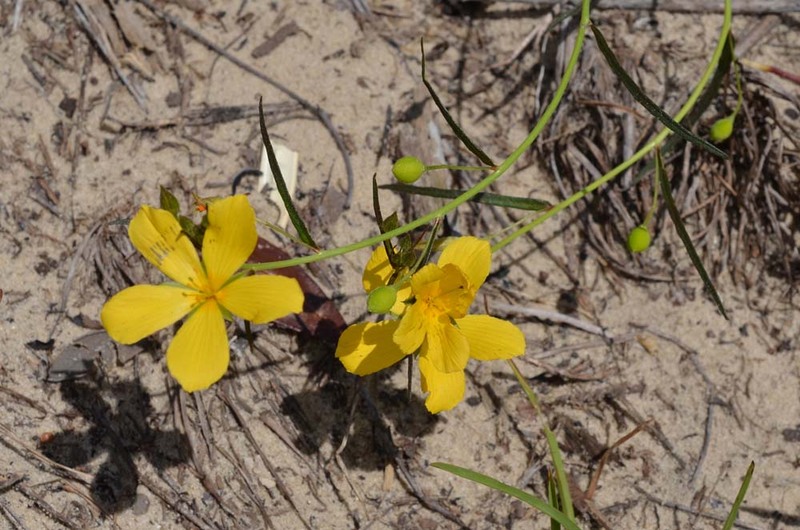 We usually find a few wildflowers near the parking area and nearby roadsides. 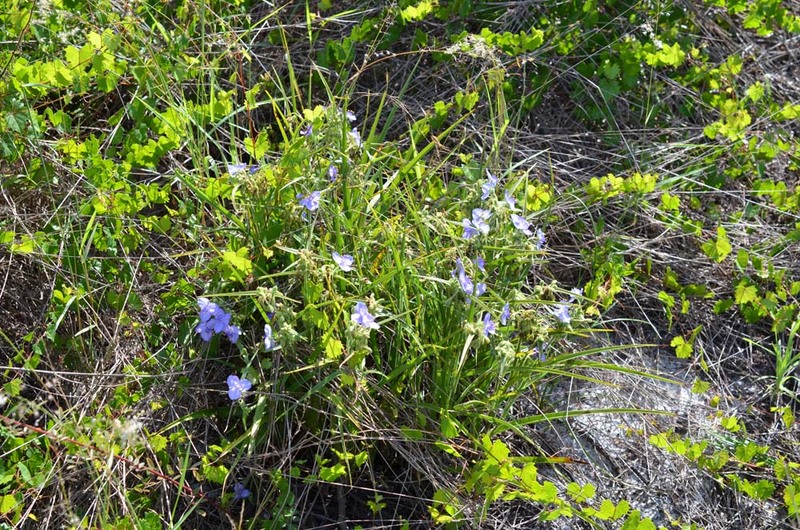 Scrub buckwheat and piriqueta (shown below) and dawnflower (shown later) were growing on this roadside slope, opposite the sign above. 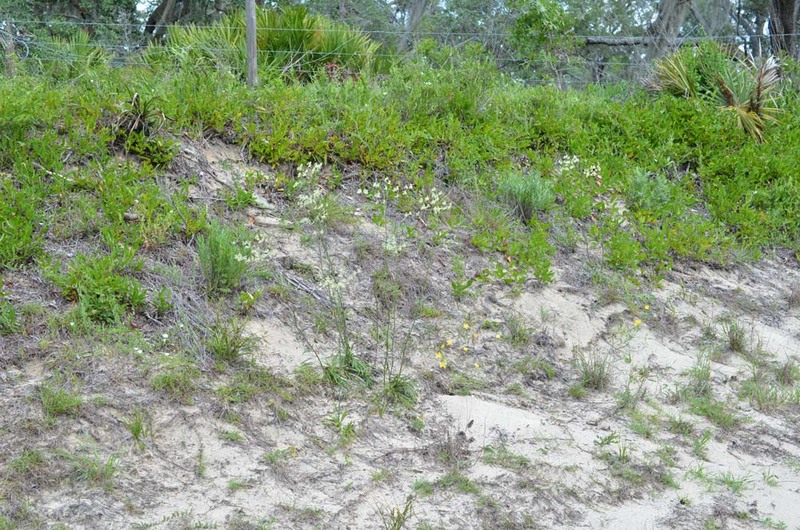 Stop #3. A primitive campground off Lake Walk-in-the-Water Road. 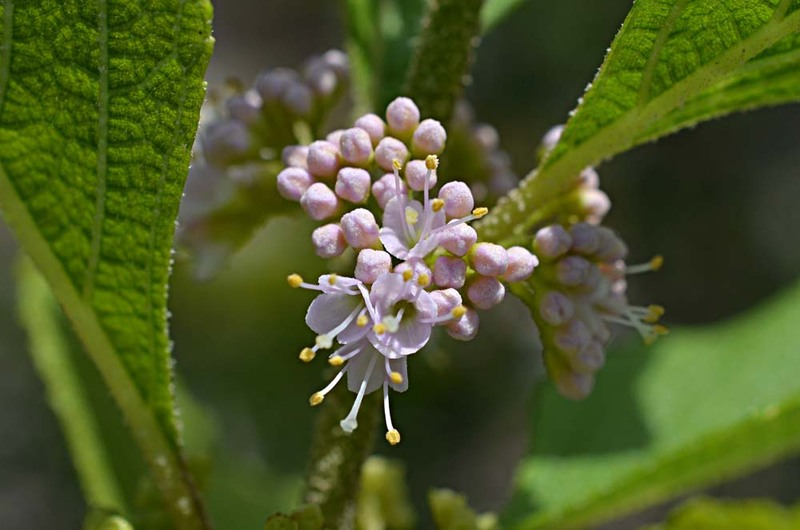 Beautyberry has star-shaped hairs on its leaves and stems. 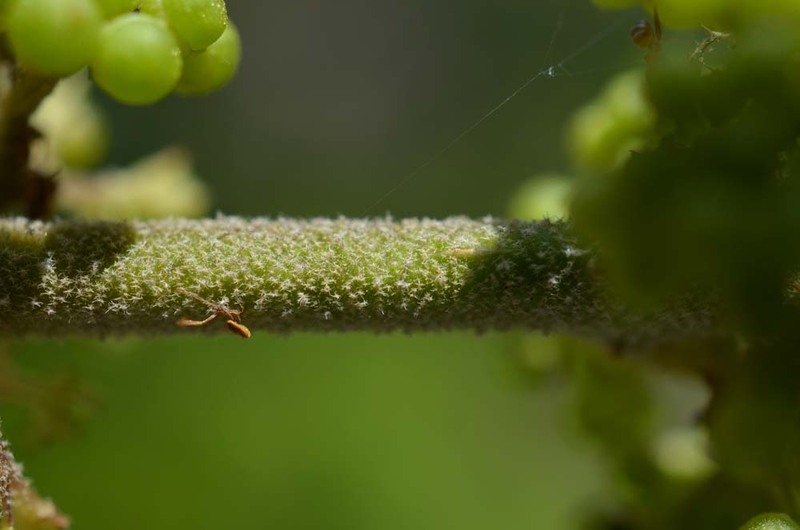 The bottom photo is a close-up showing the starry hairs on the stem, which give it a soft, velvety feel. 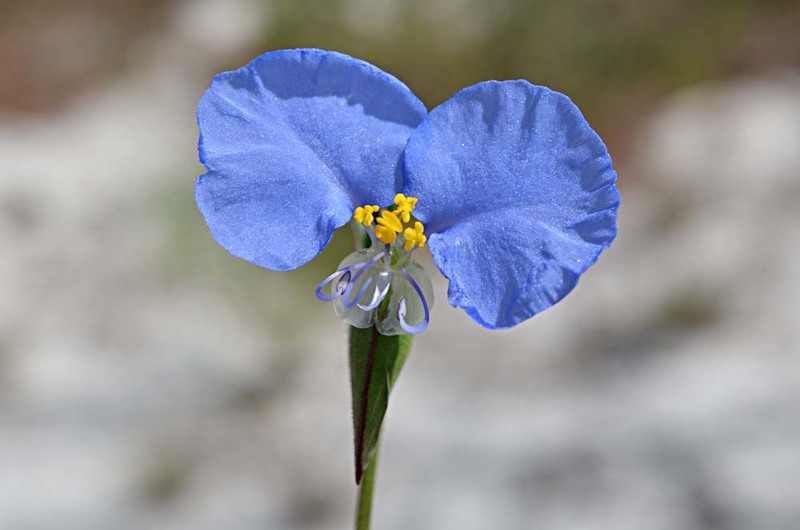 This is a new species for me. 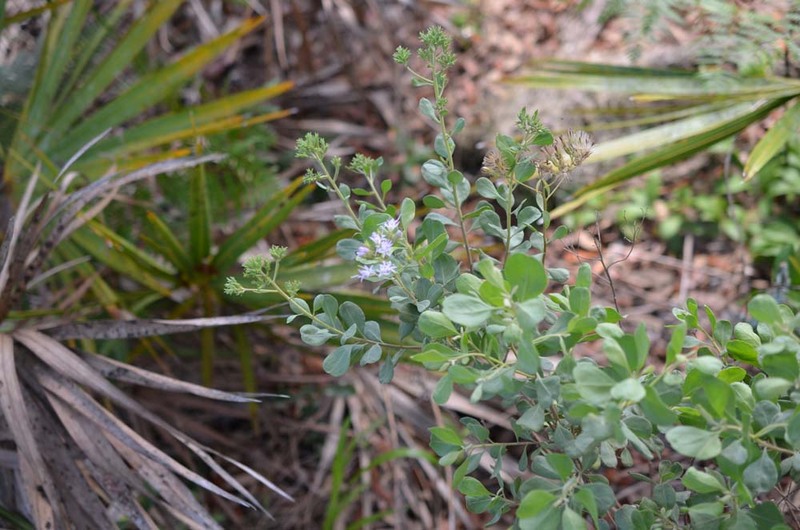 I had photographed Garberia plants back in October 2011 at the Florida Wildflower Symposium in Wekiwa State Park, but they weren't in bloom then, and I was unable to identify them. 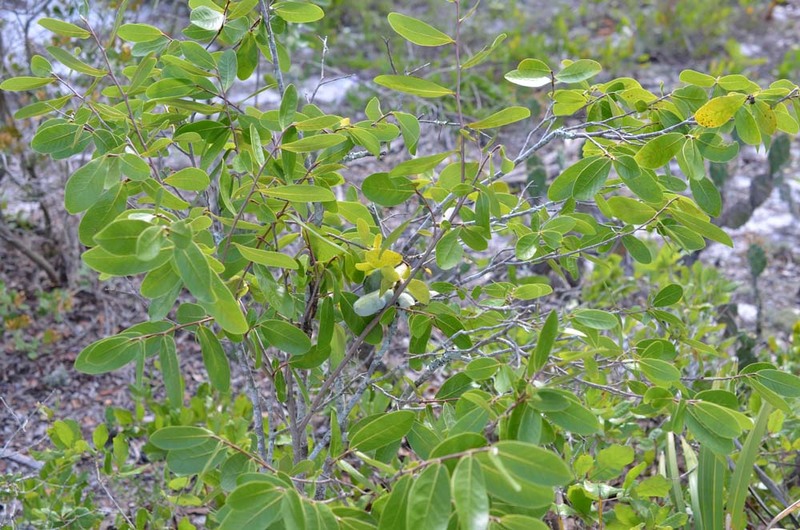 Now that I know it, the paddle-shaped leaves readily identify this plant. 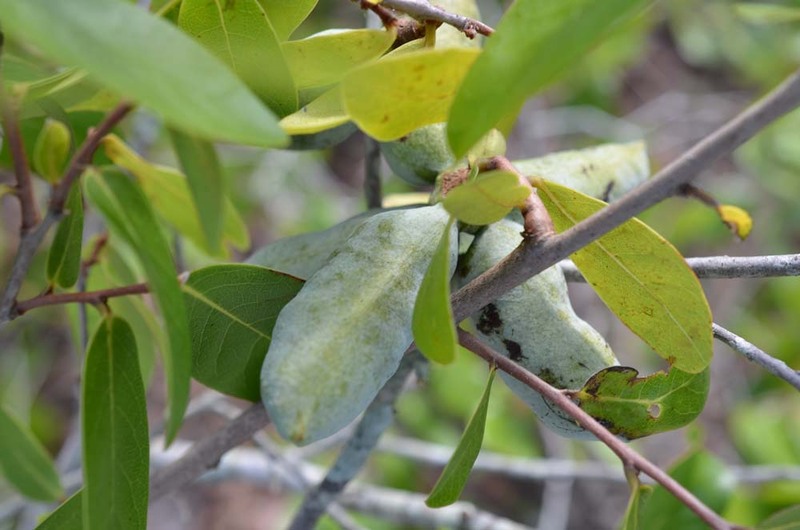 Garberia is sticky, and the crushed leaves have a piney odor. 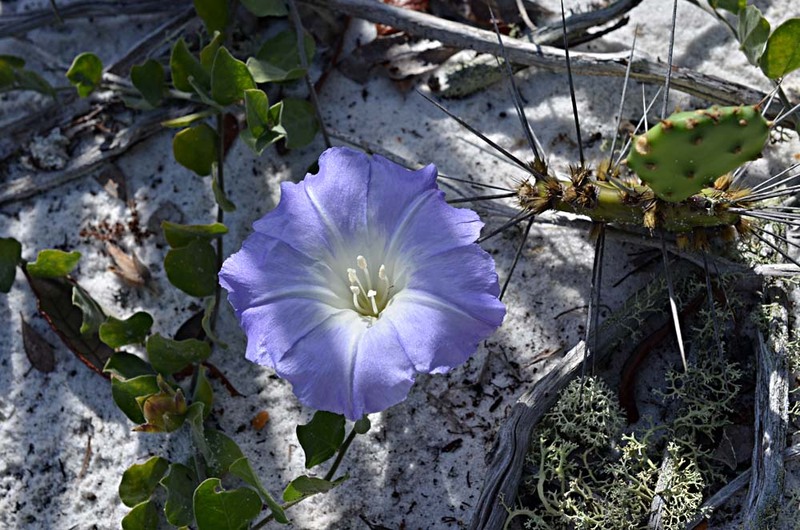 Stop #4. 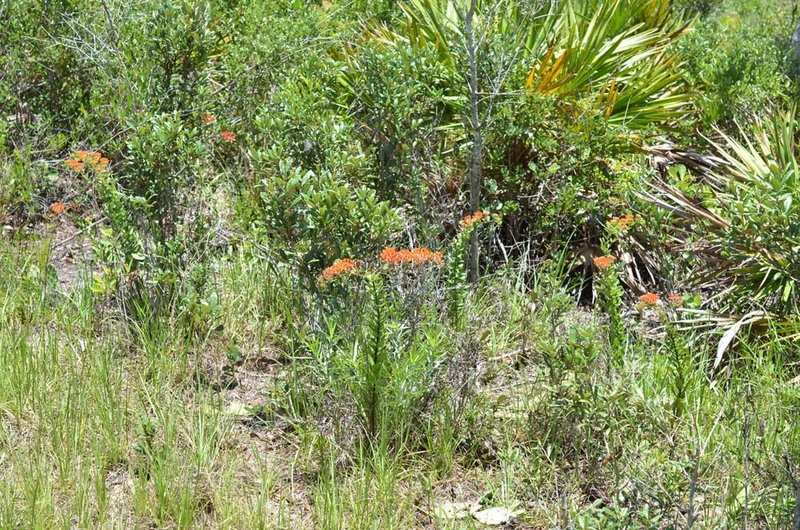 Scrub Jay Loop Trail a dry, sandy area in the LWR Forest. 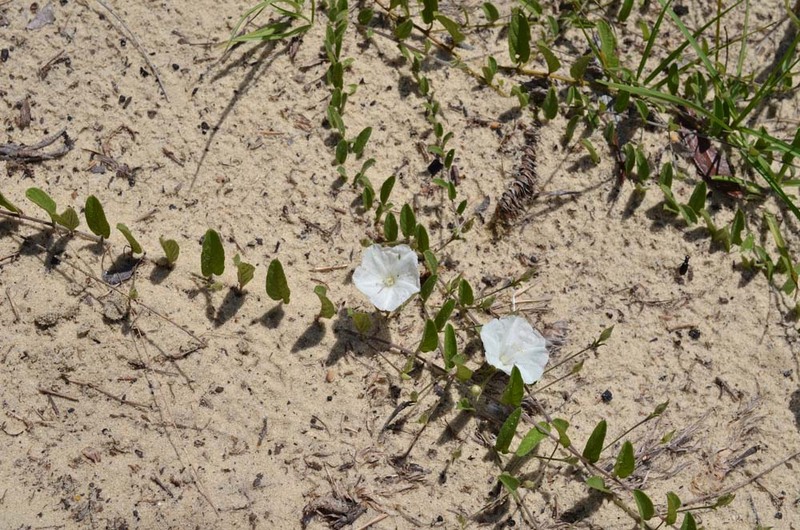 This small, white morning glory was very abundant. 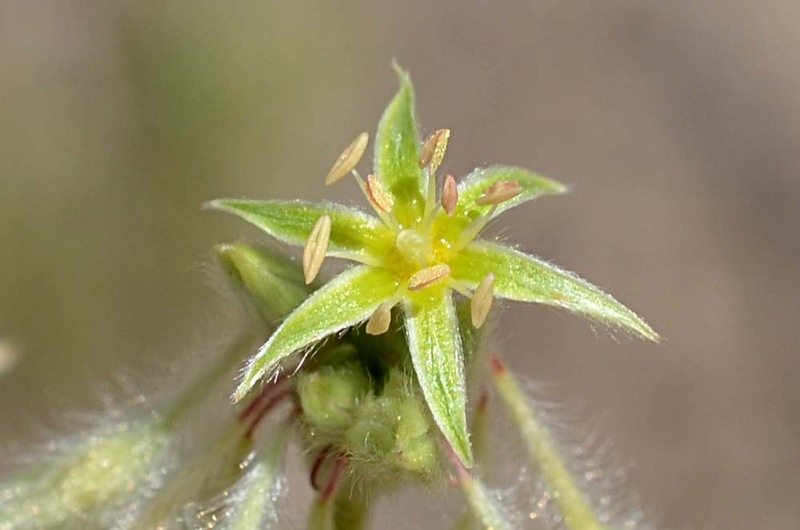 The hairy sepals, leaves, and stems identify this as S. villosa. 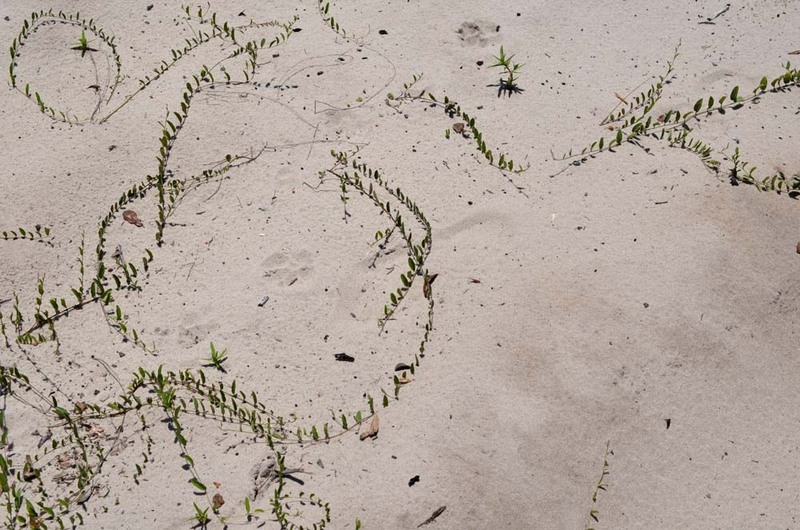 The meanderings of some plants in the open sand reminded me of writing. 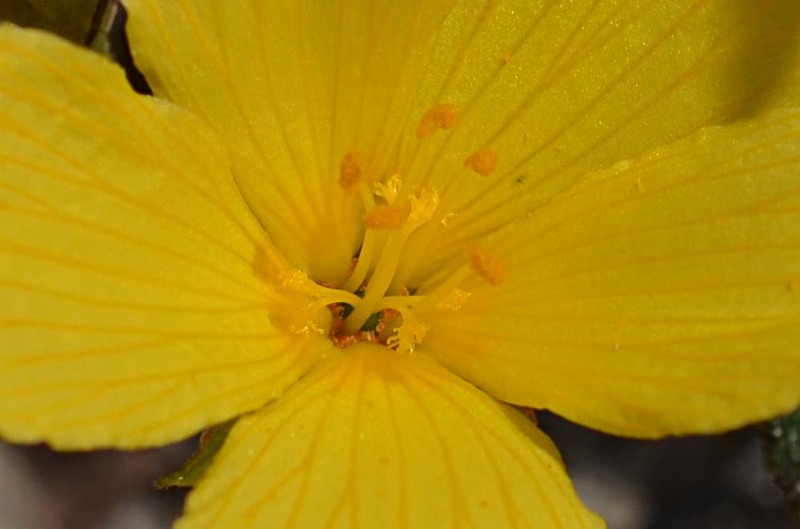 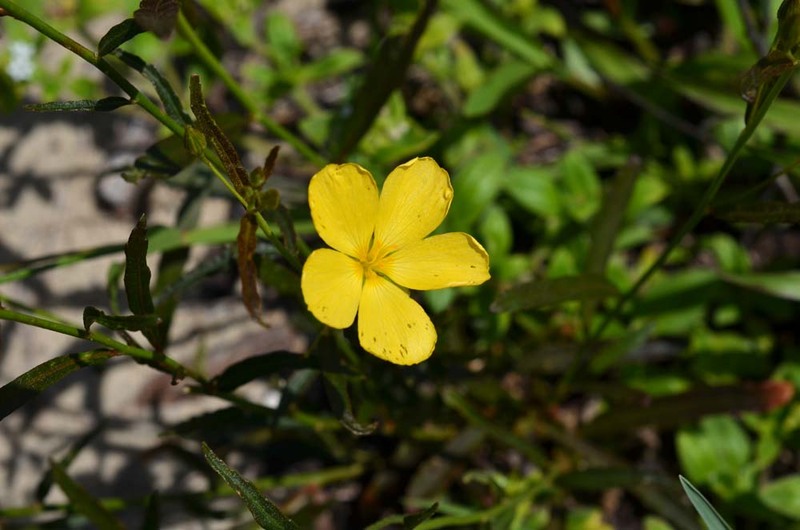 The needlelike leaves and the habitat (bog) help identify this St.John's-wort, shown as the yellow-green plants running through the center of the bottom photo. 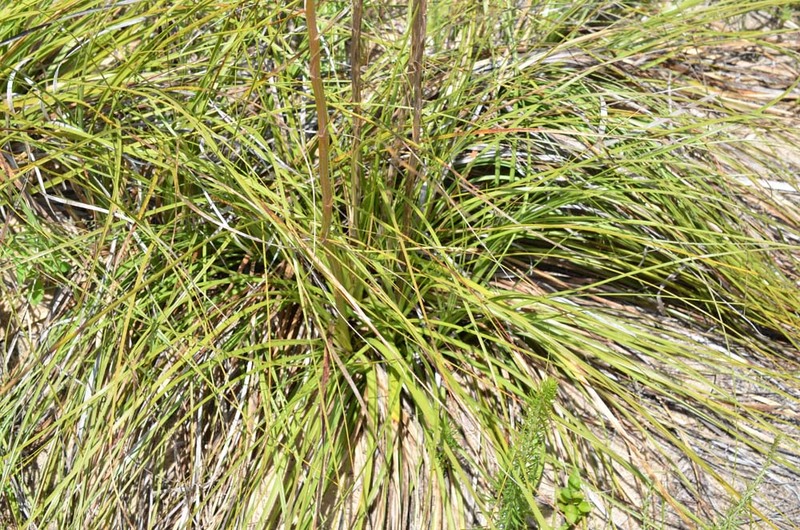 This plant is tall, spindly, and as the name implies, sticky. 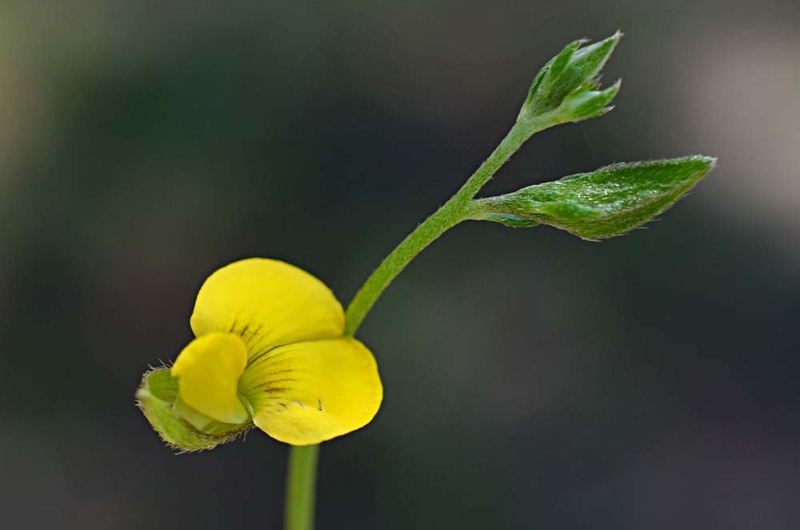 A very common, widespread pea. 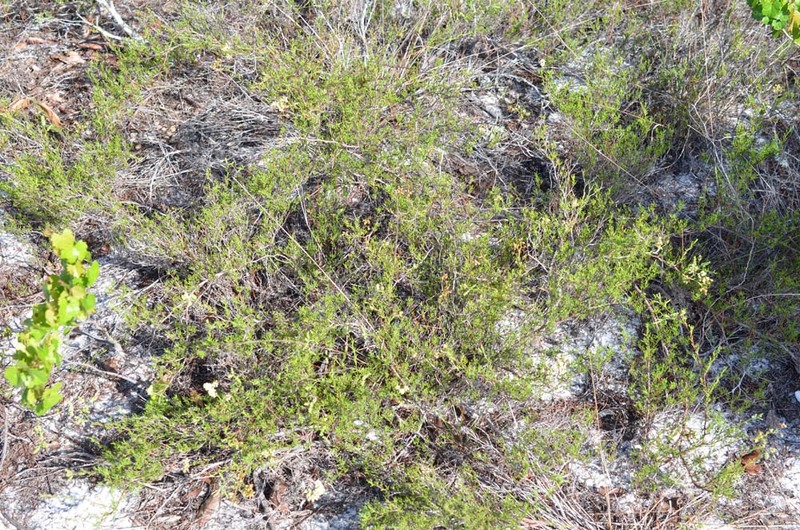 A small patch of scrub off US 17, a few miles south of Frostproof. 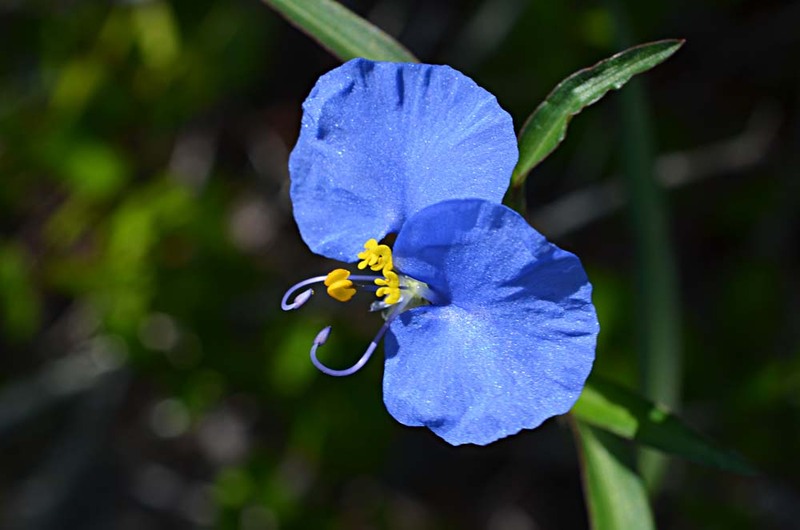 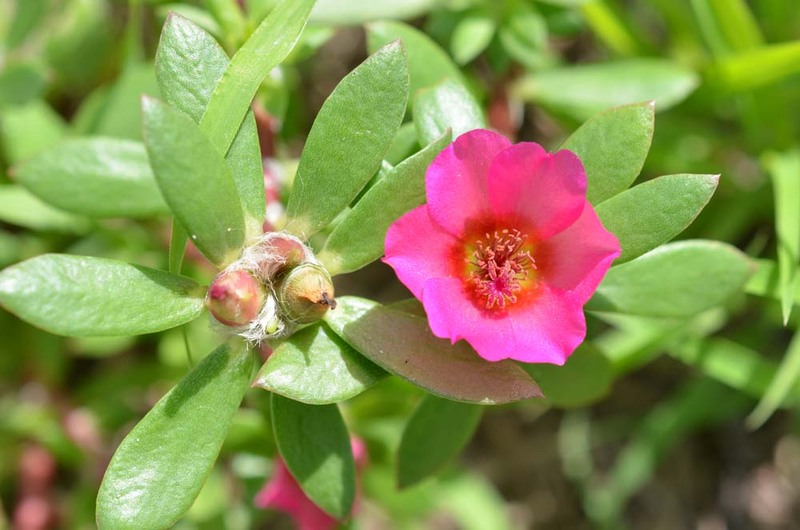 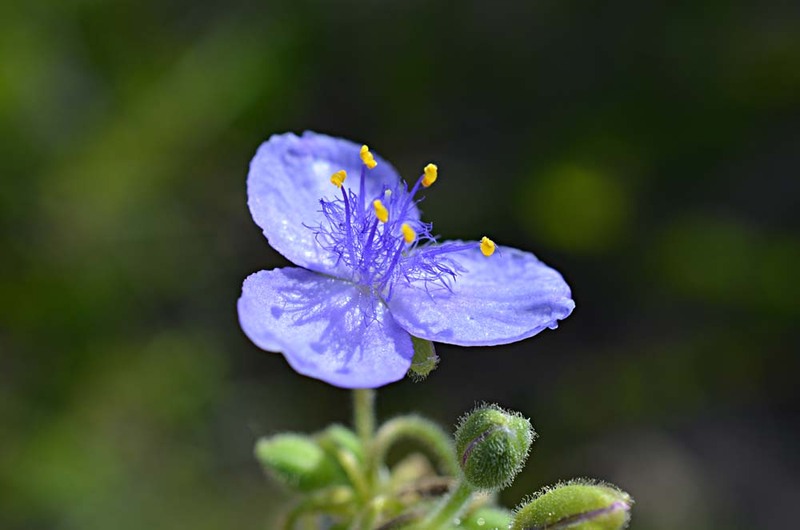 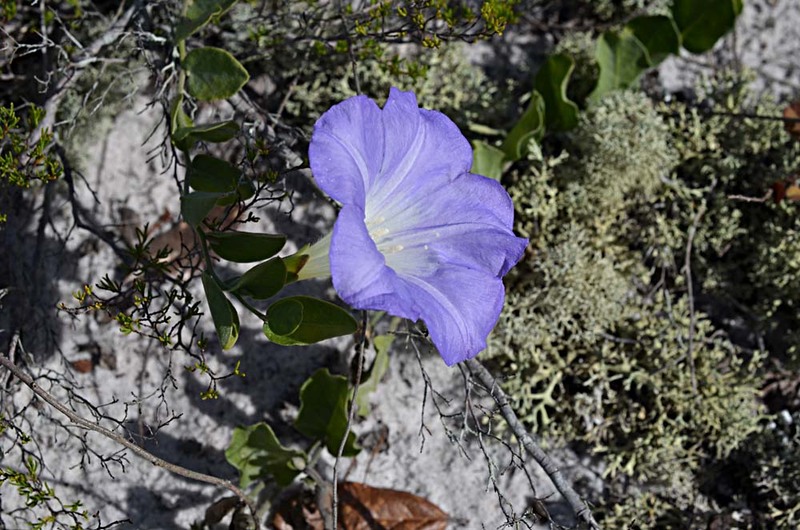 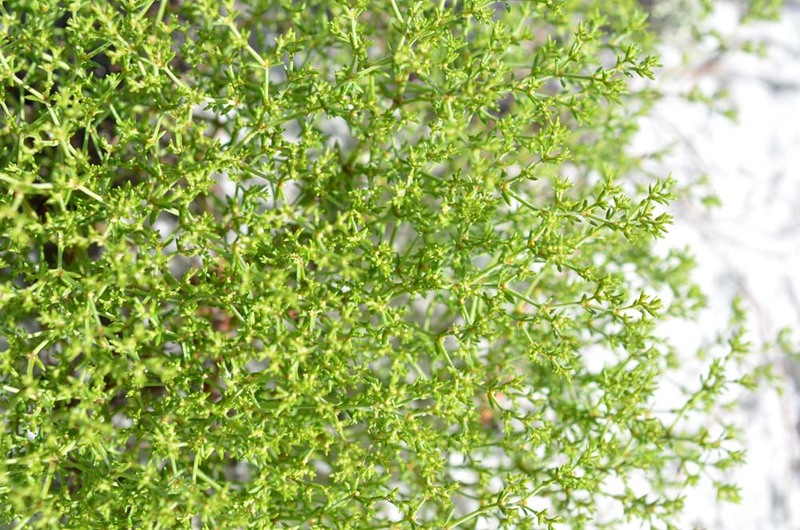 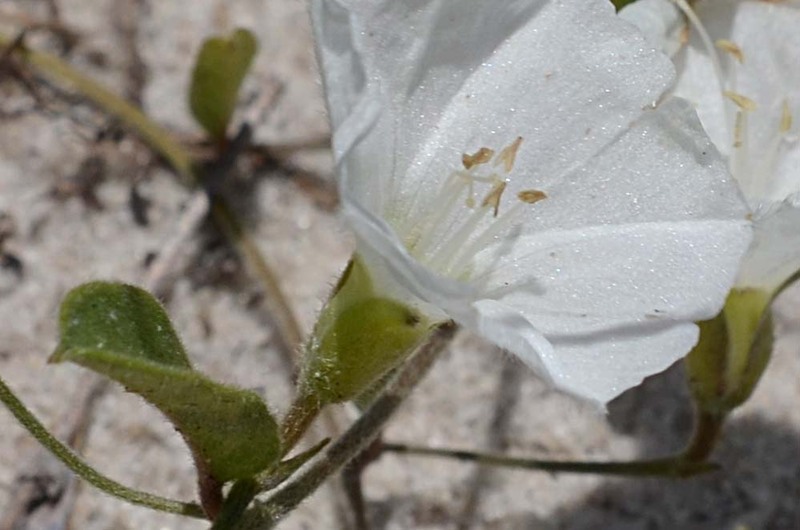 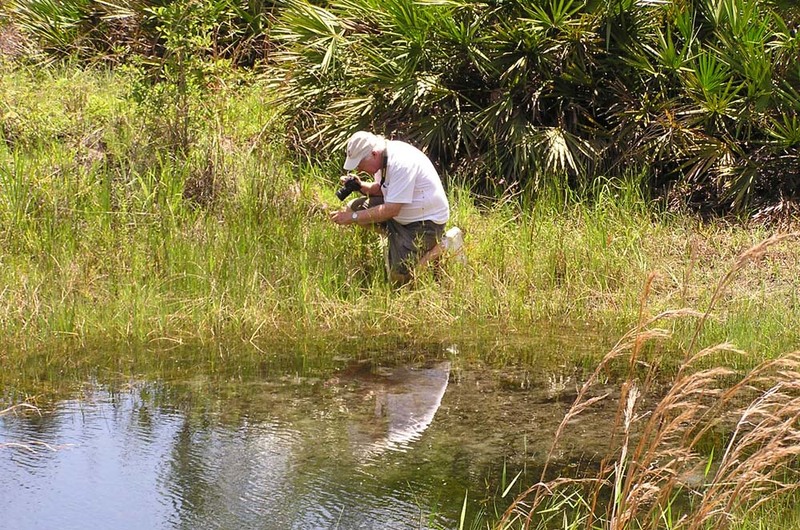 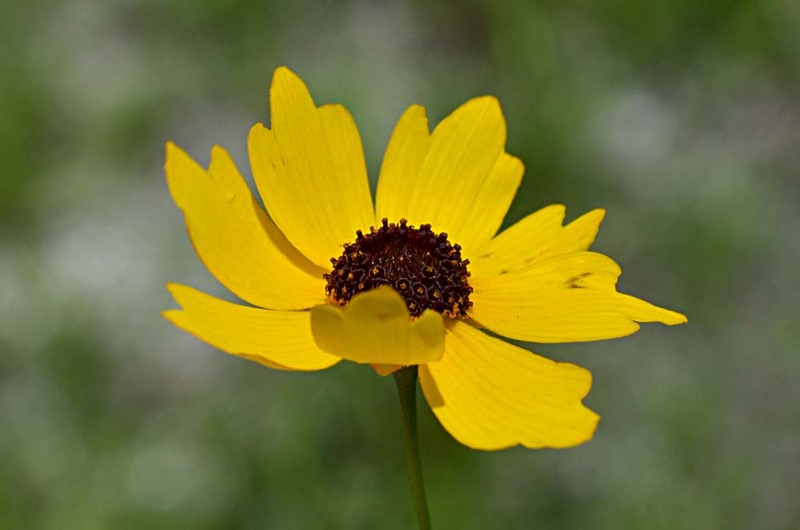 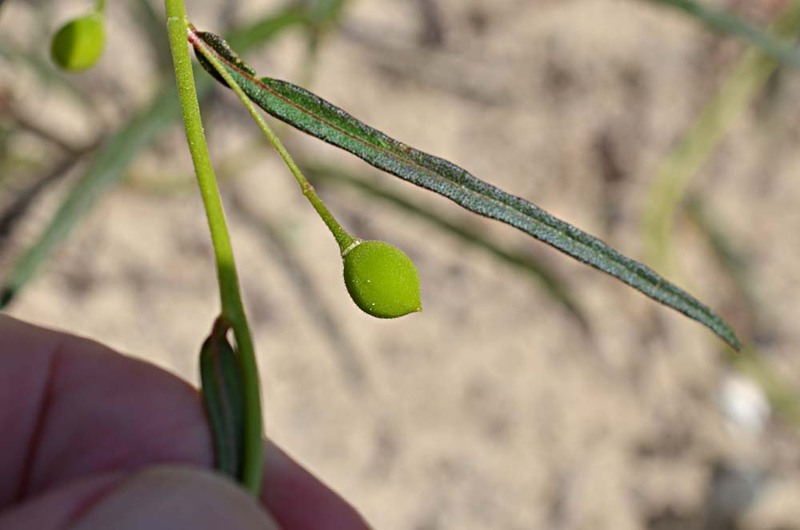 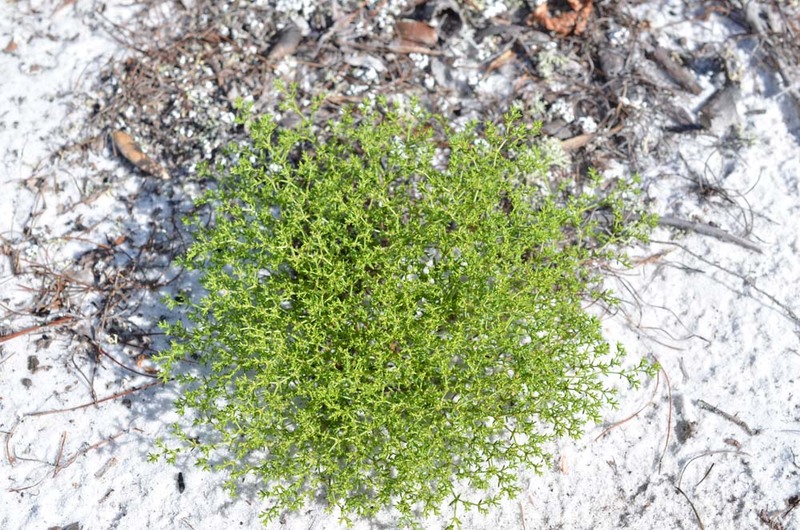 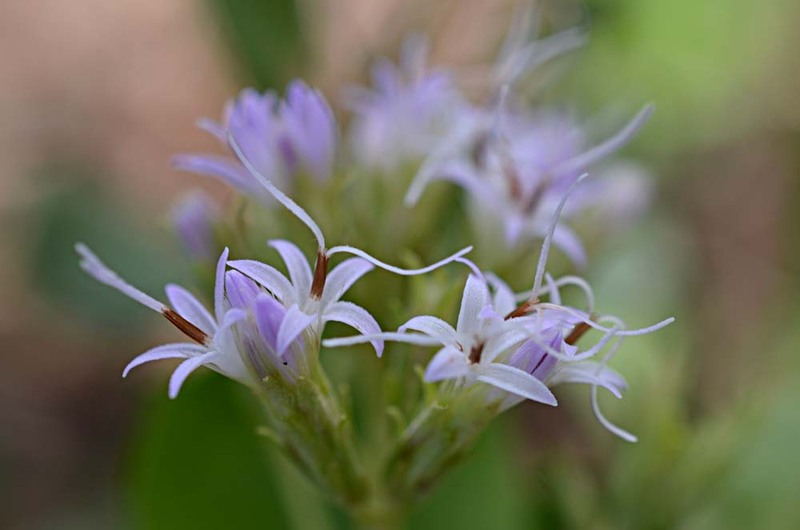 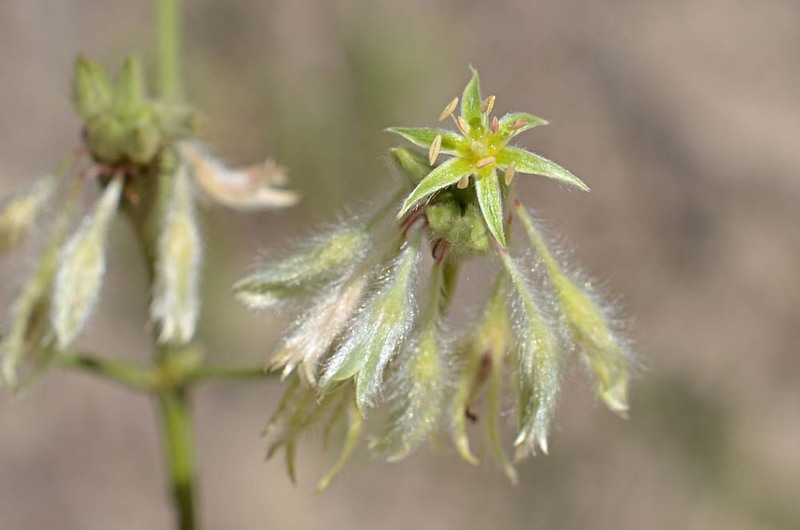 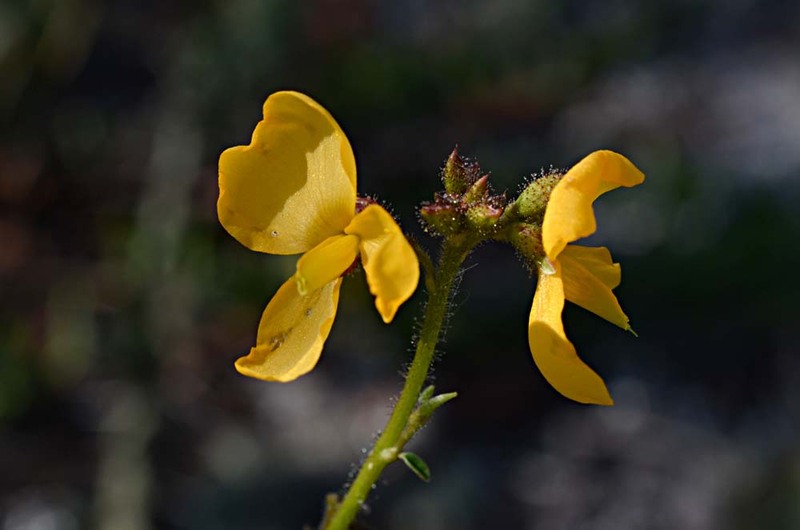 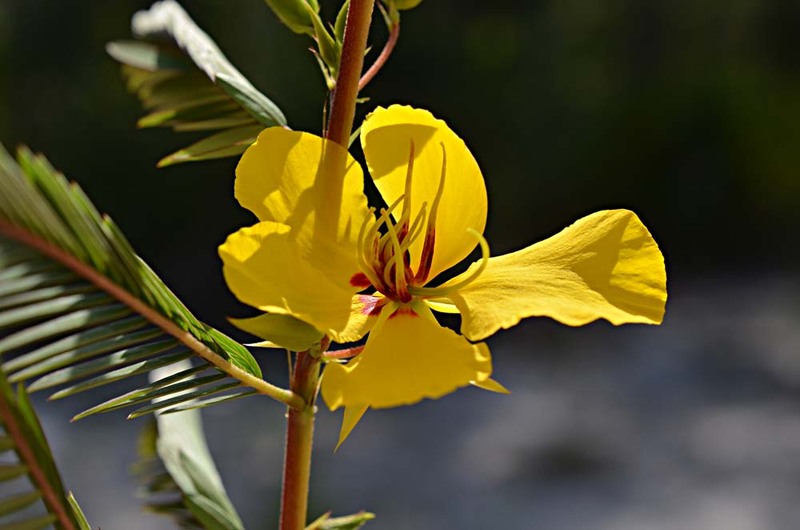 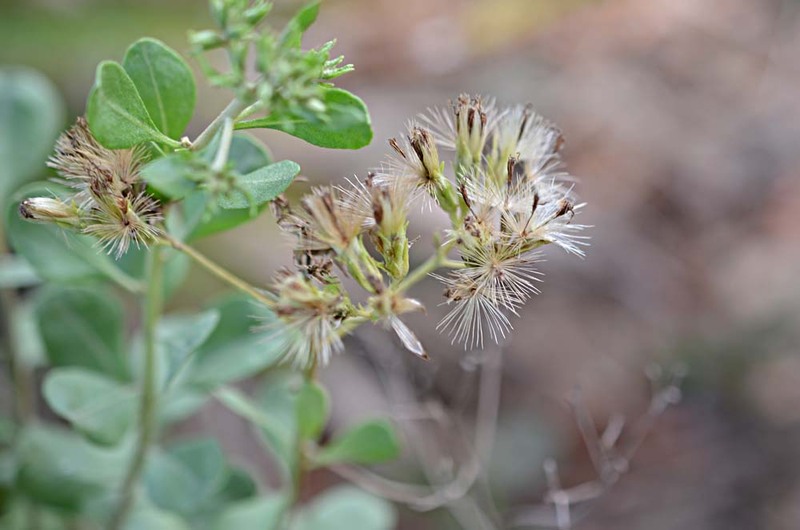 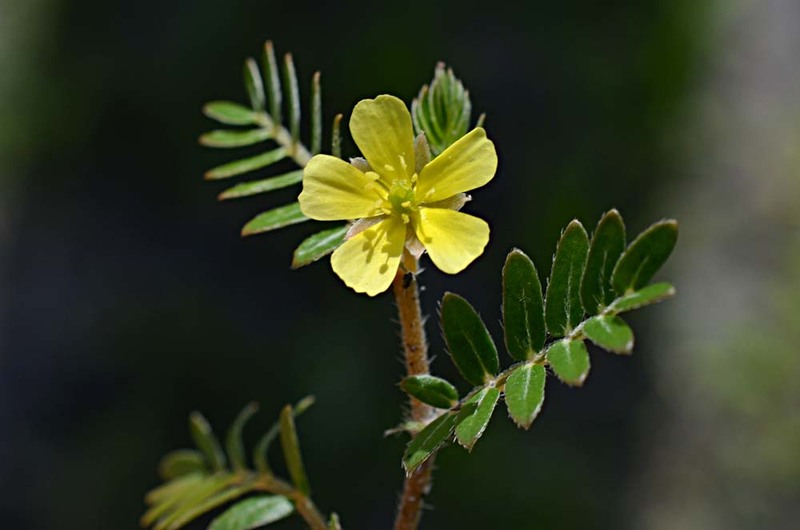 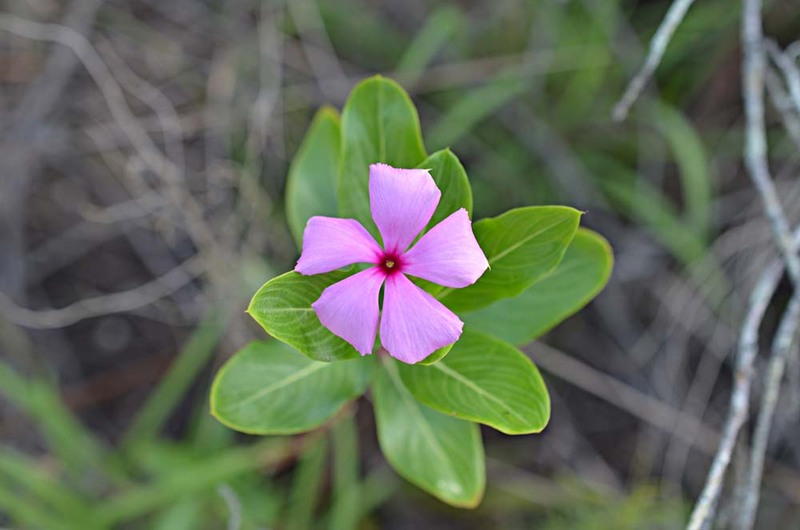 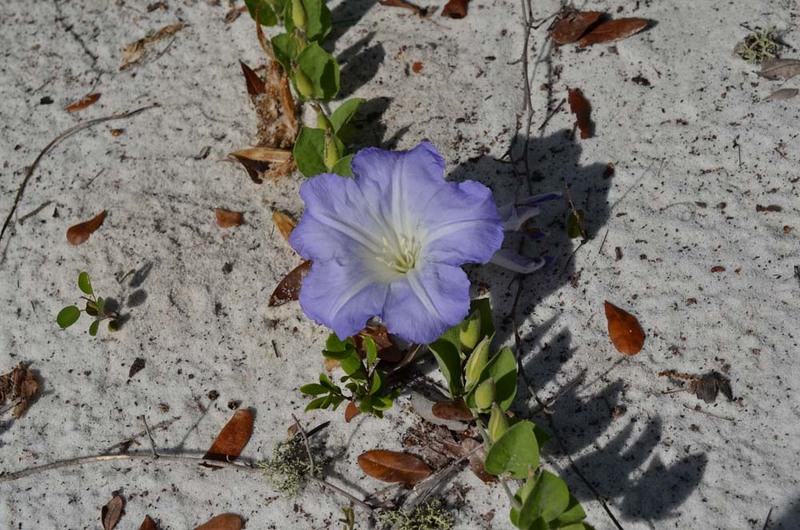 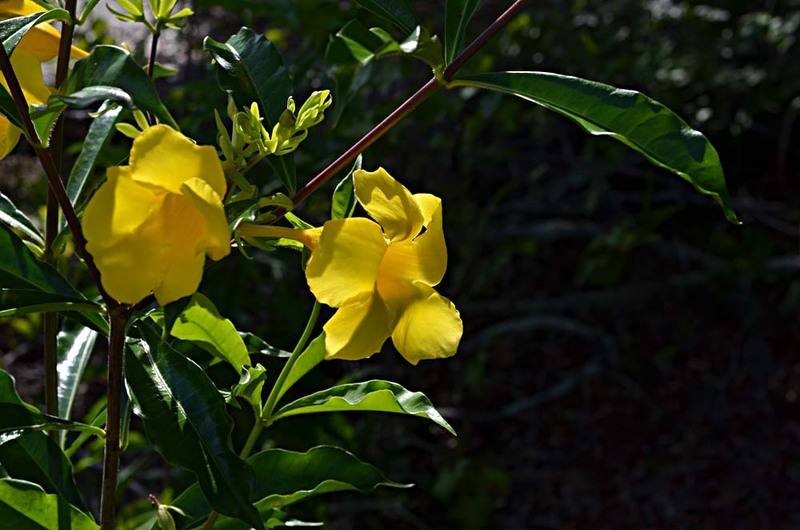 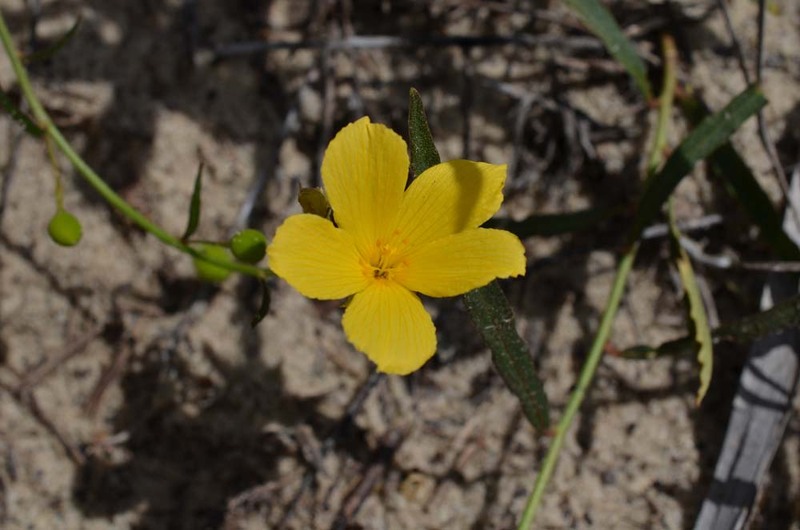 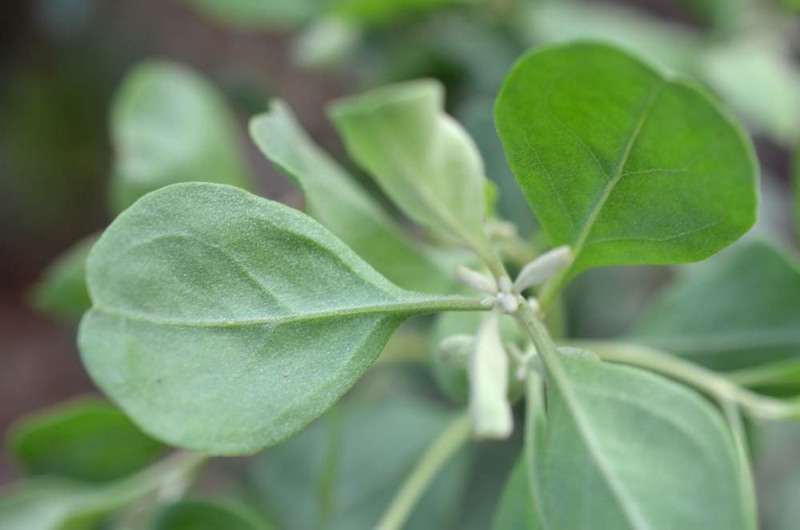 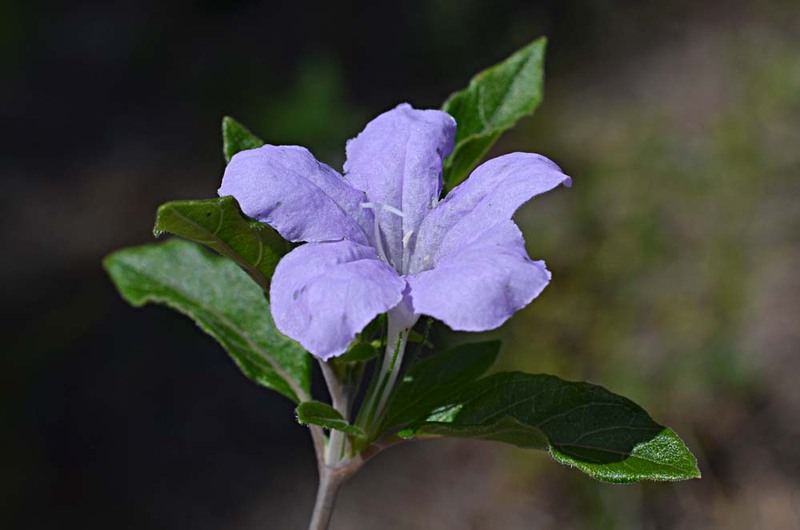 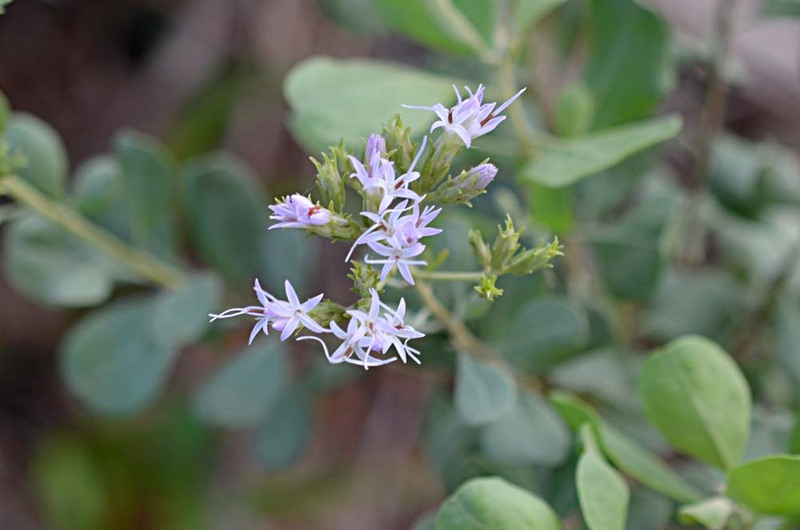 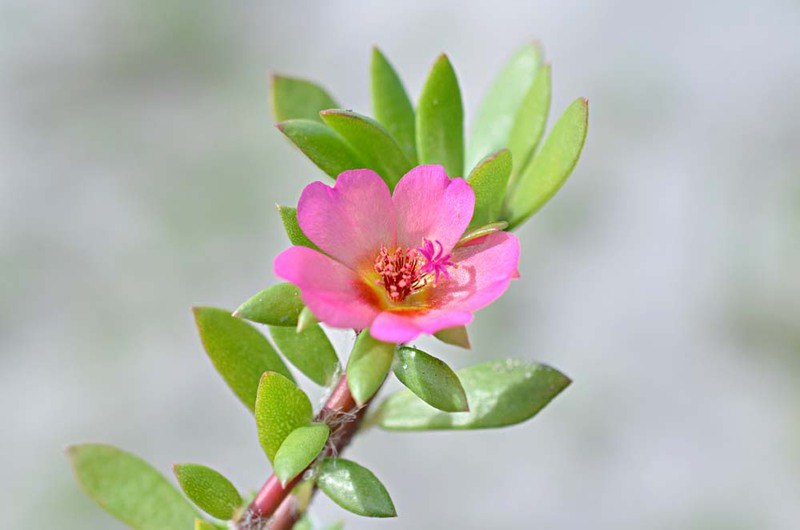 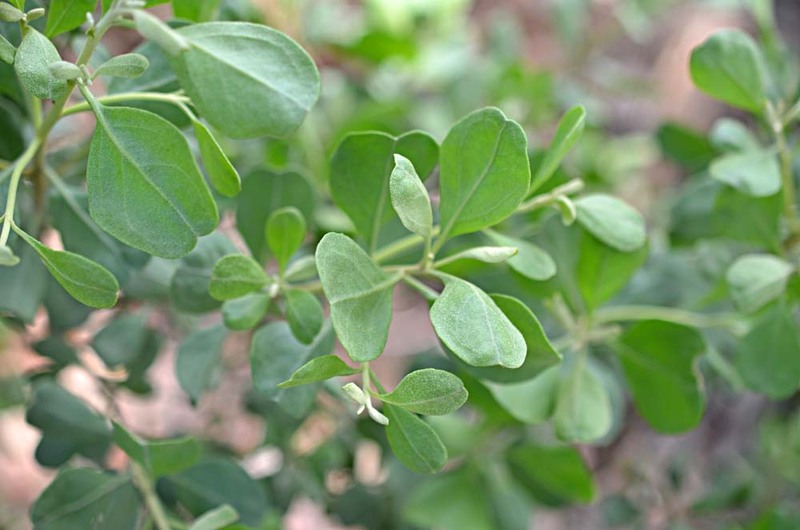 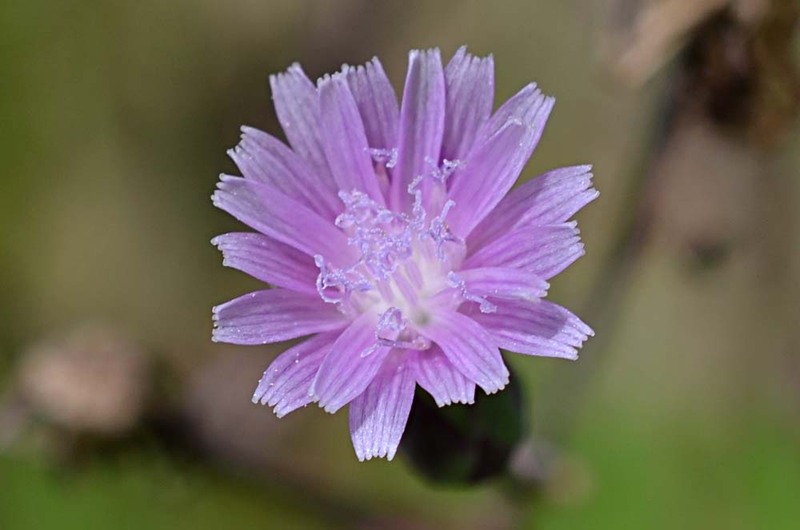 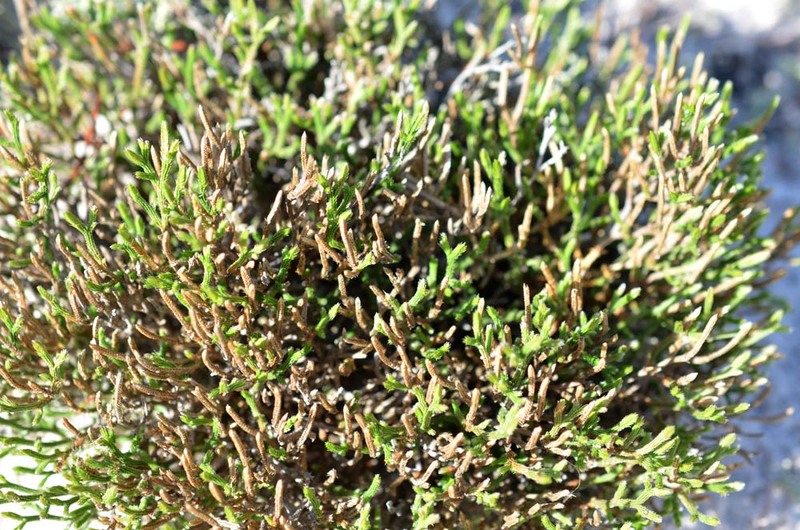 "Scrub is Florida's Version of a Desert--Scrub has helped to make the Lake Wales Ridge famous because it is home to a large number of rare plants. 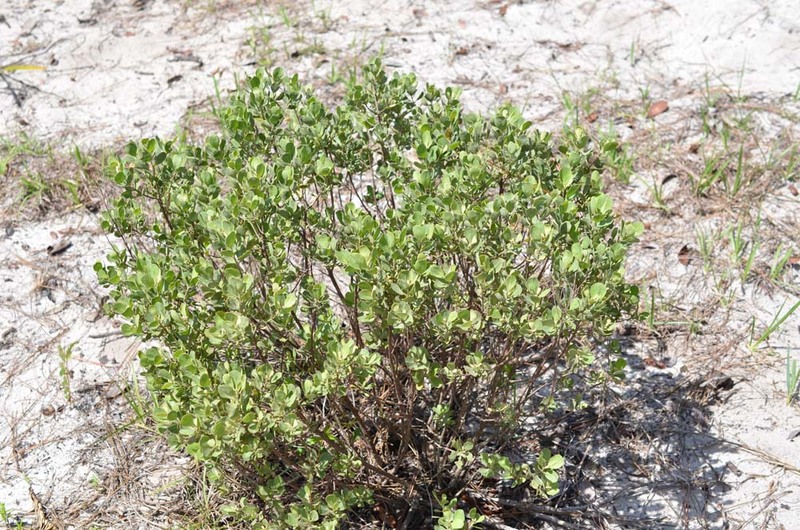 Clumps of shrubs, mostly oaks and blueberry relatives, cover the sandy knolls and are interspersed with open patches of bare sand. 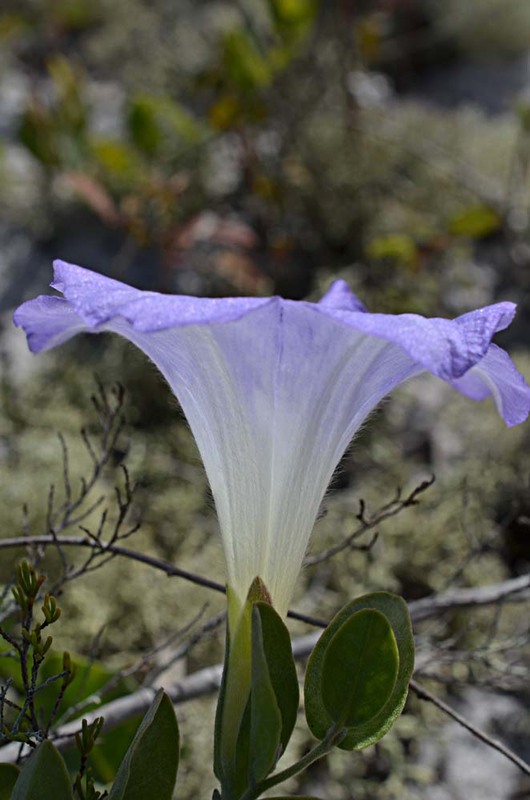 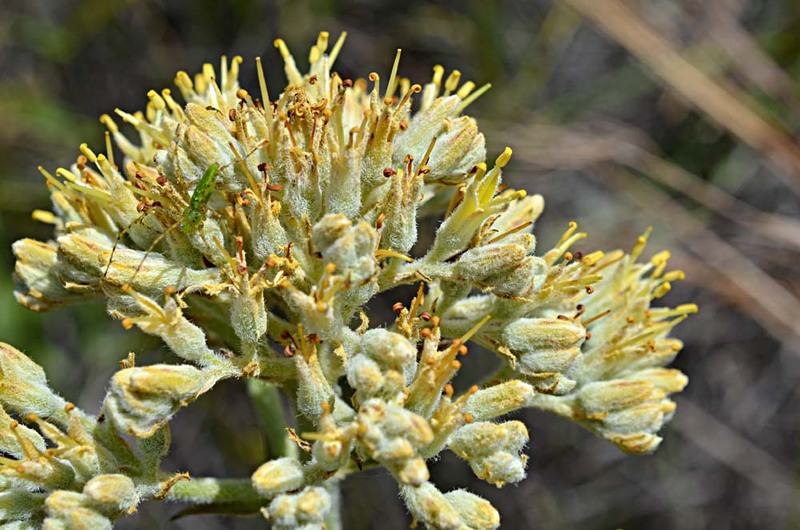 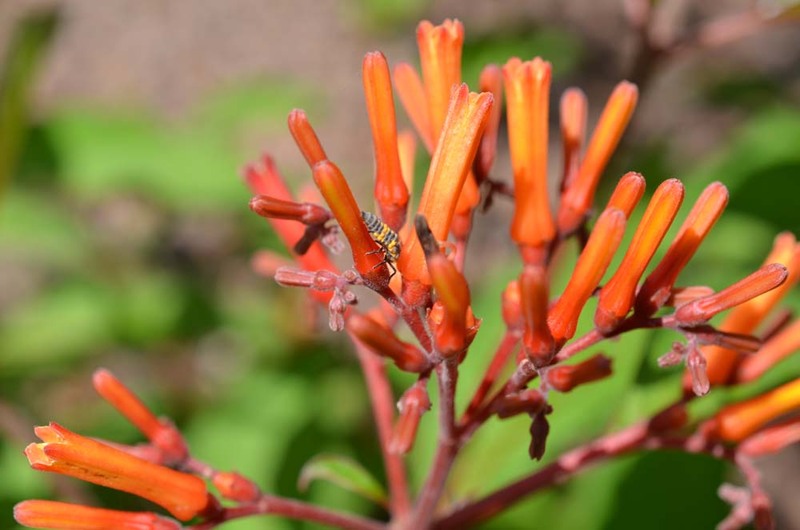 Through eons of time, plants have found ways to flourish in the heat and drought of the scrub. 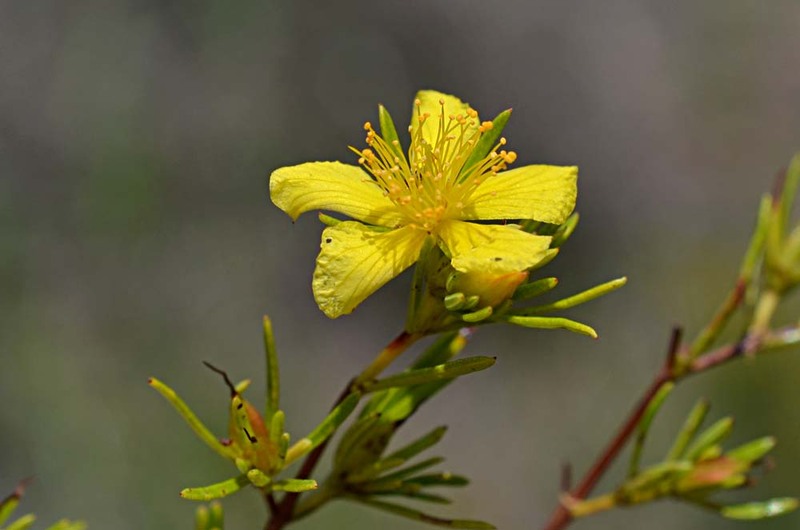 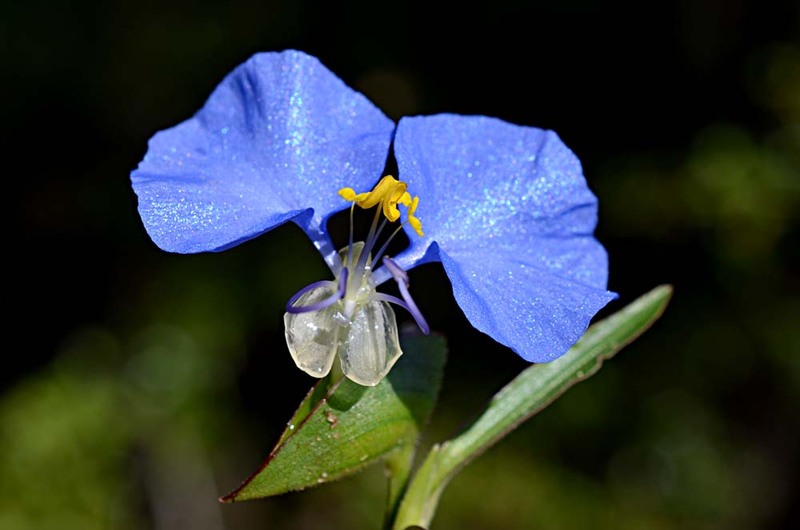 Plants like palmettos, oaks, and lyonias have stiff, leathery leaves; lupines have hairy leaves; and still other plants, like blueberries and hypericums, have extremely small leaves--all these features help the plants conserve water. 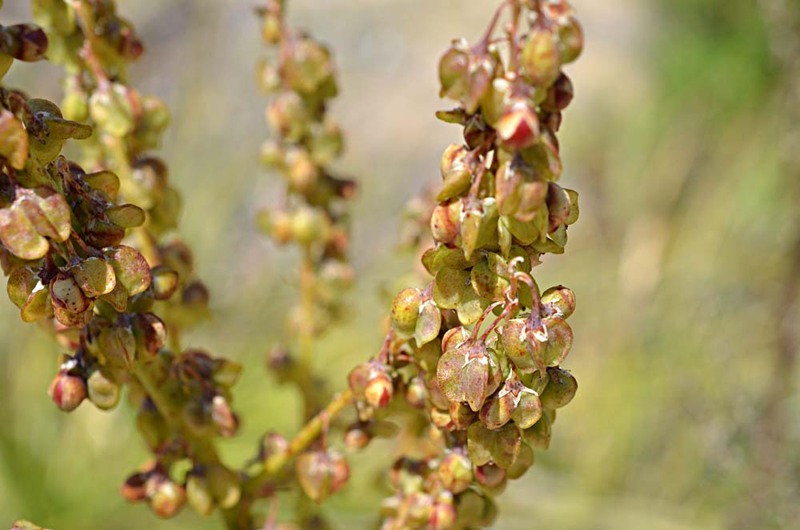 "More than 85 percent of these dry uplands have been converted to citrus cultivation and residential and commercial development. 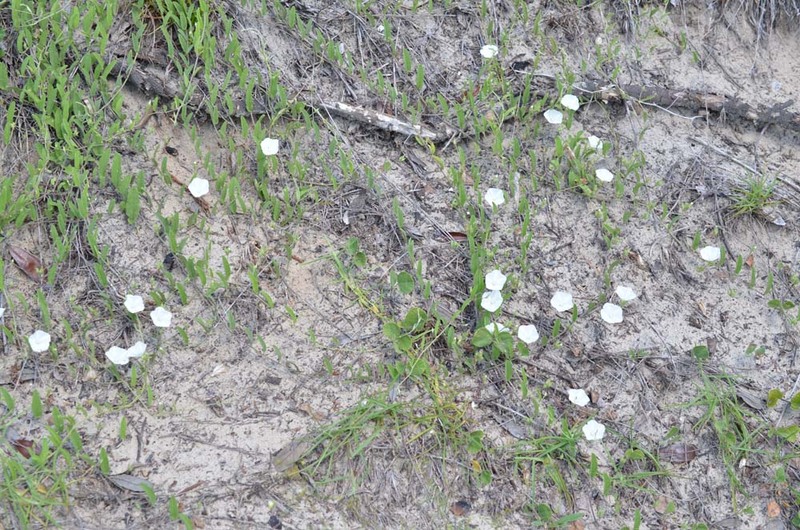 Only a few pristine tracts remain; the rest occur in small scattered parcels. 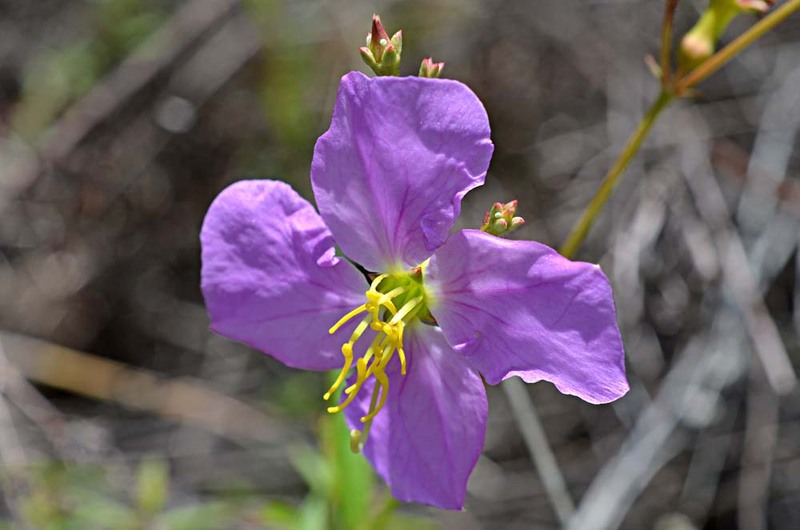 Because of habitat loss, many of the Ridge's unique plants and animals are threatened with extinction." 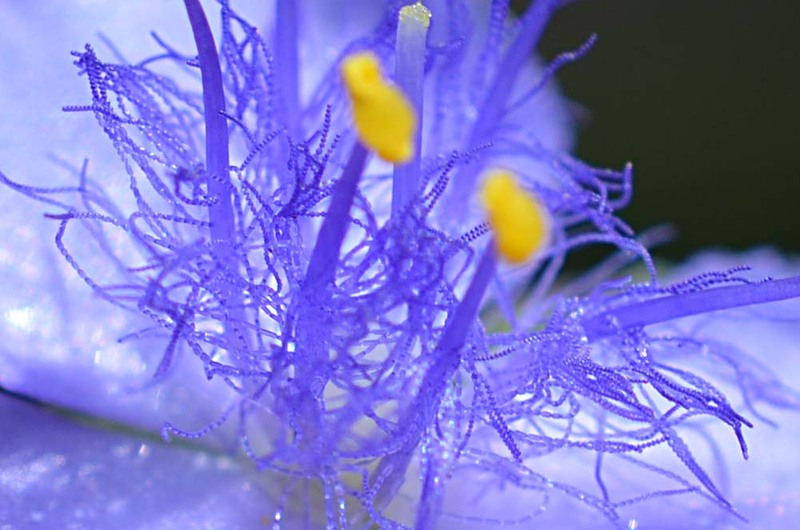 This is a tentative identification. 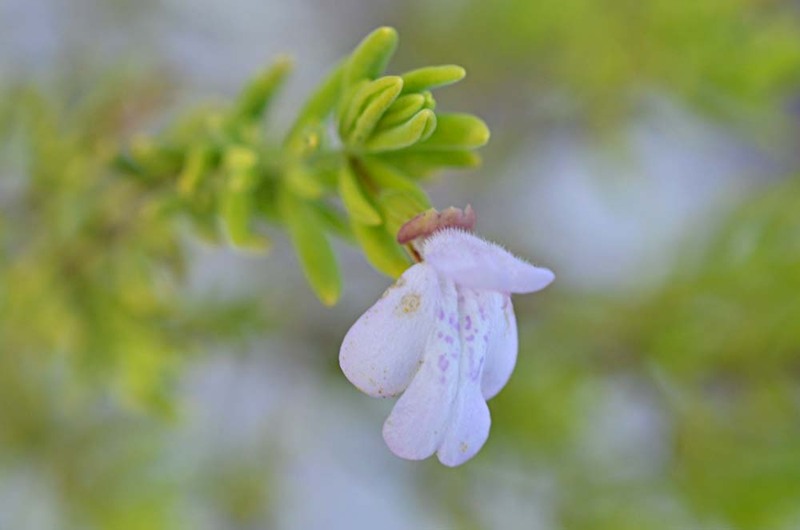 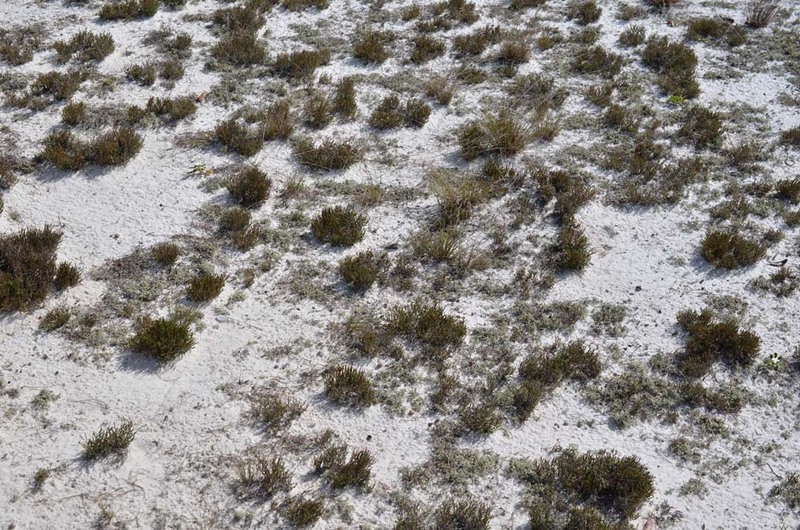 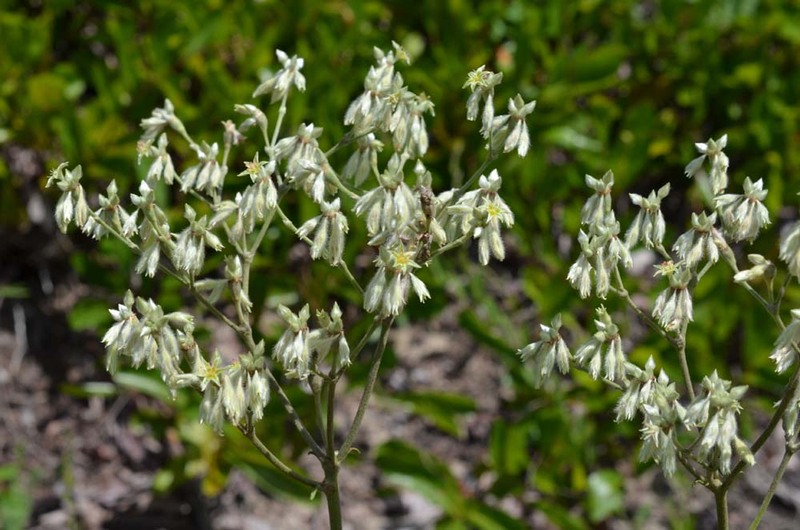 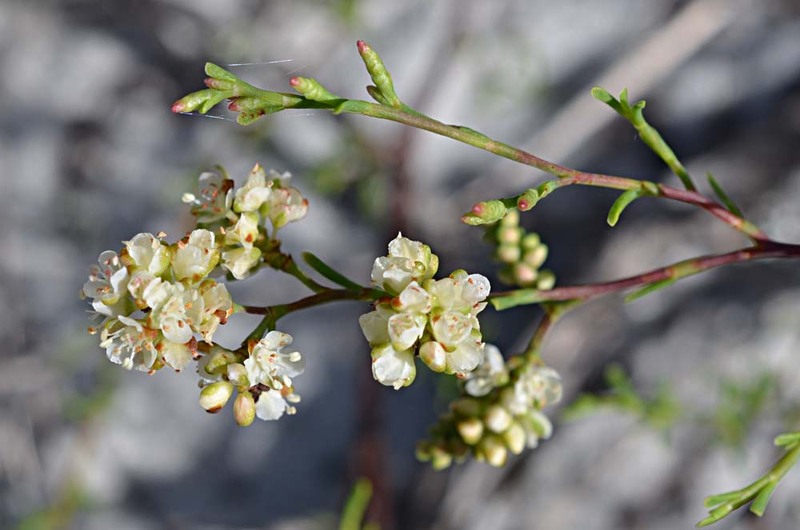 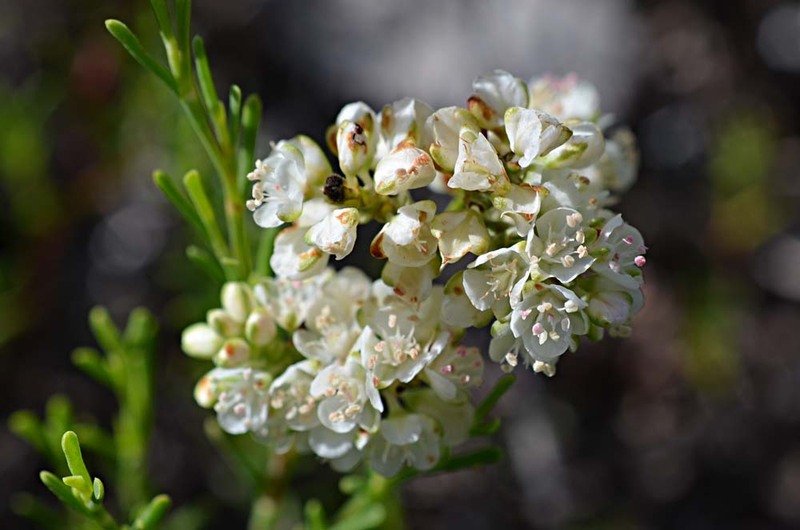 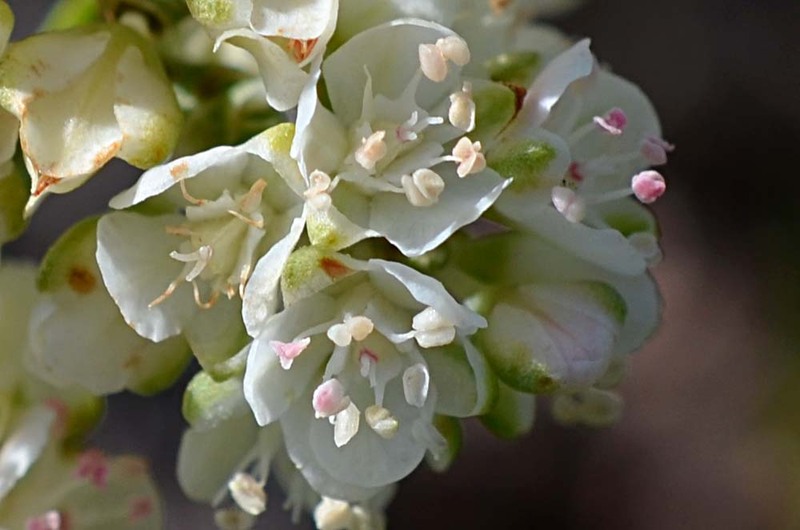 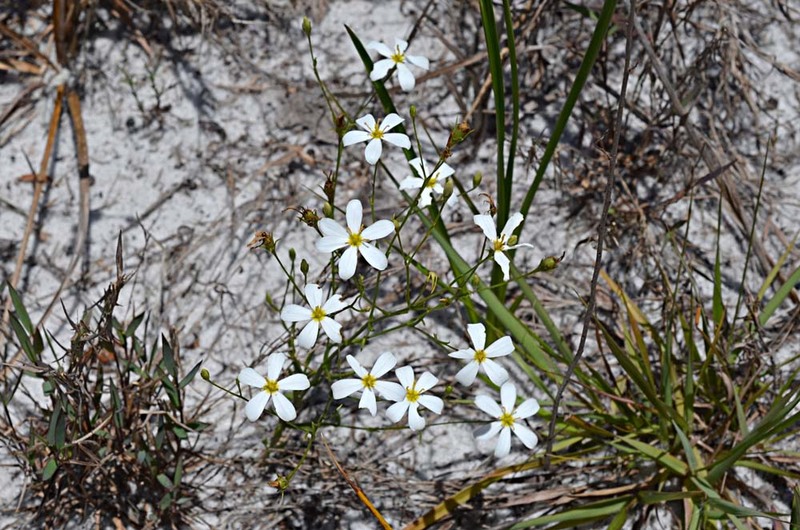 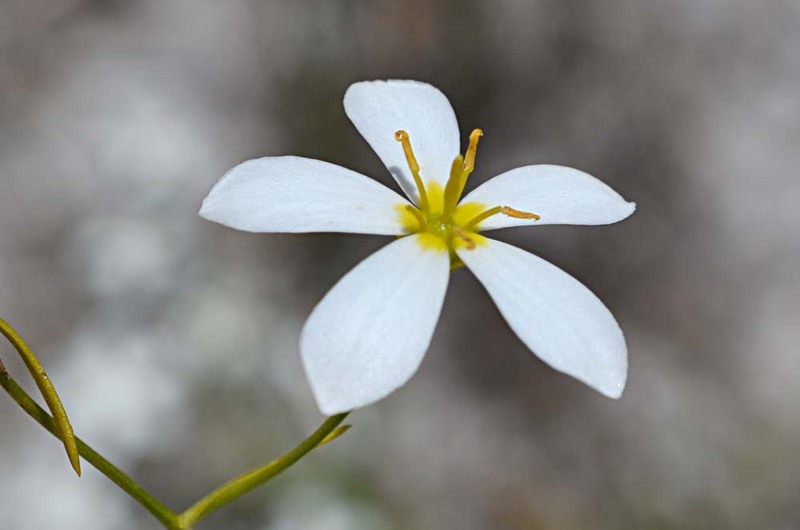 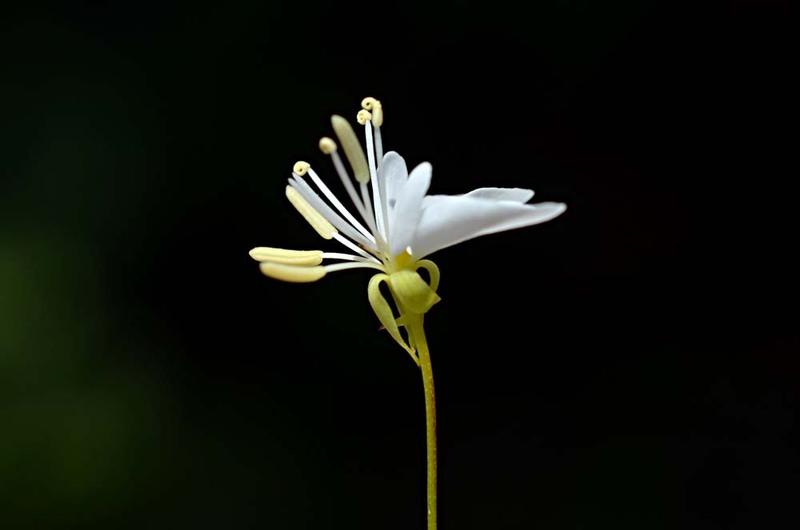 "This sprawling bonsai-like shrub has clusters of white-to-cream-colored flowers and is one of the most distinctive and easily recognized plants of the Florida scrub." 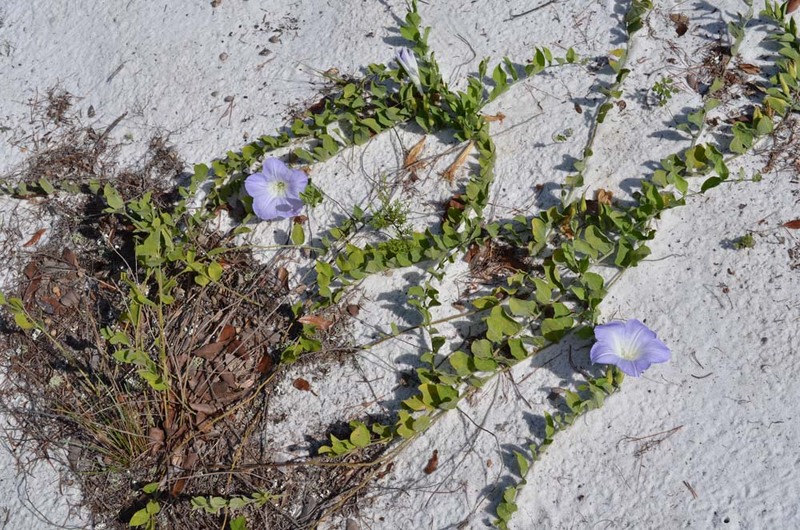 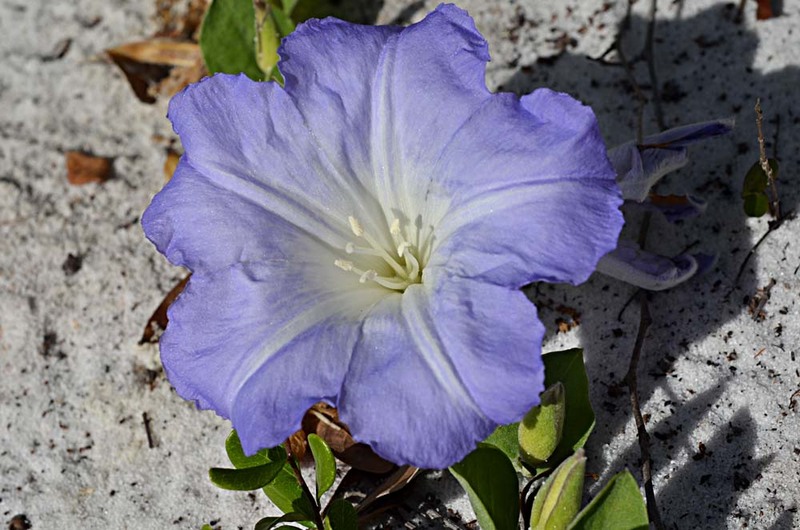 "This morning glory vine thrives in open sand patches. 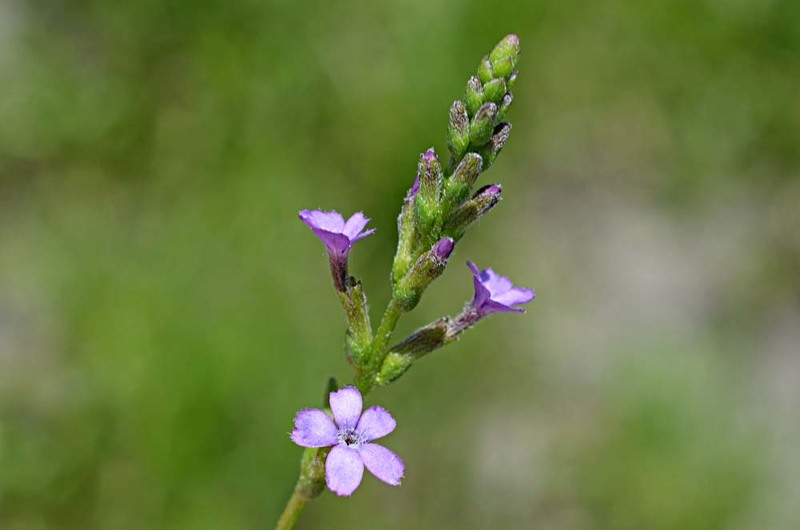 Its large bluish-lavender flowers bloom in summer and open during the cool of the morning." 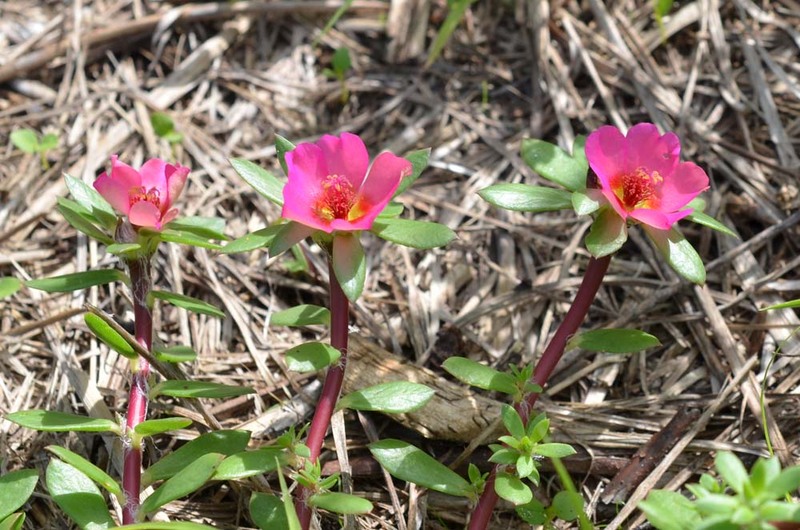 Roselings were abundant. 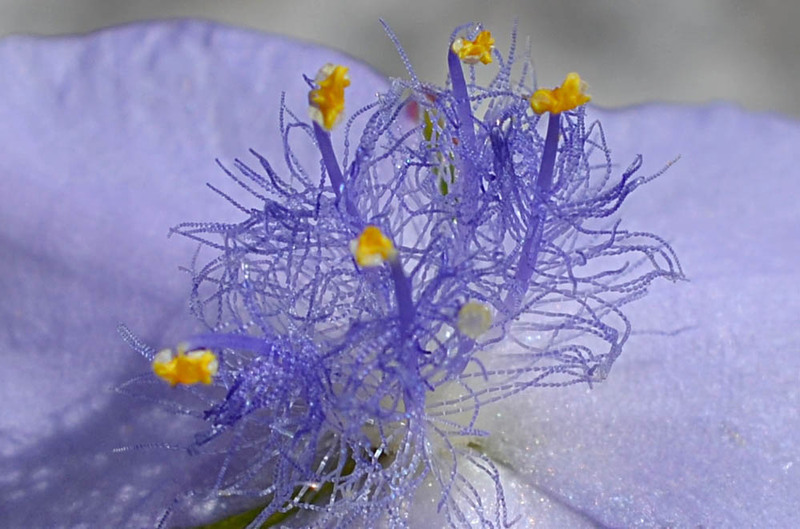 Beautiful blue, delicately beaded hairs are attached to the filaments. 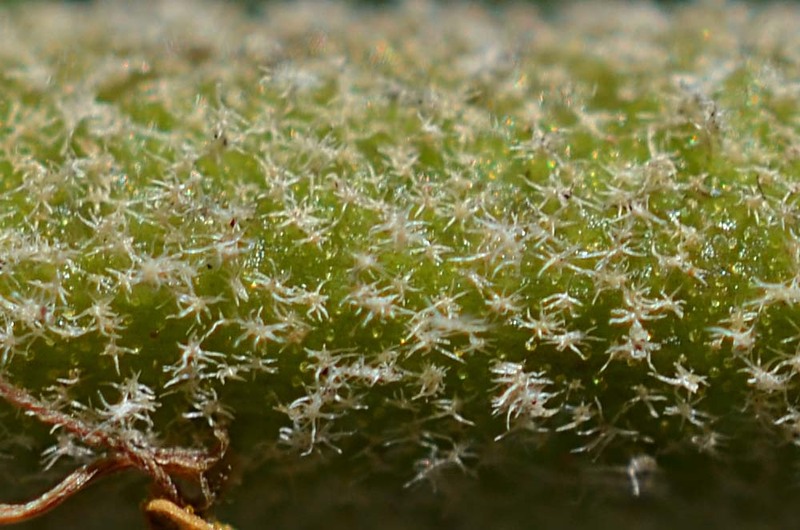 I wonder what is the purpose of these hairs? 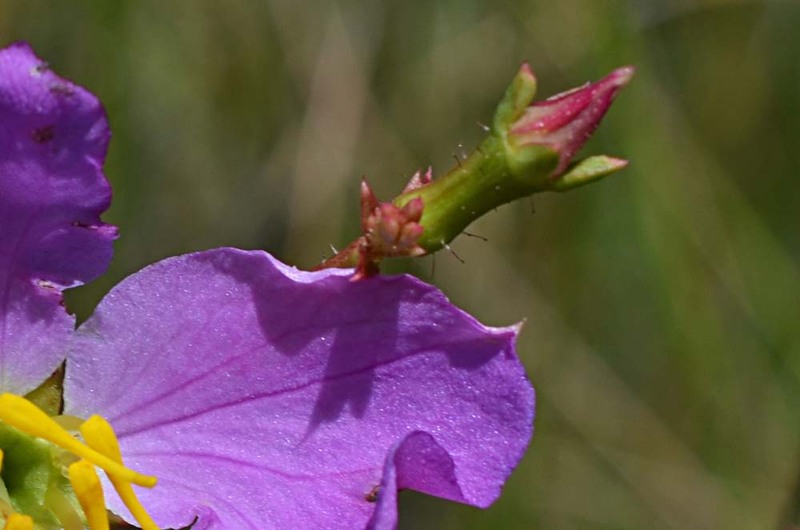 Maybe they slow down insects and increase chances of pollination. 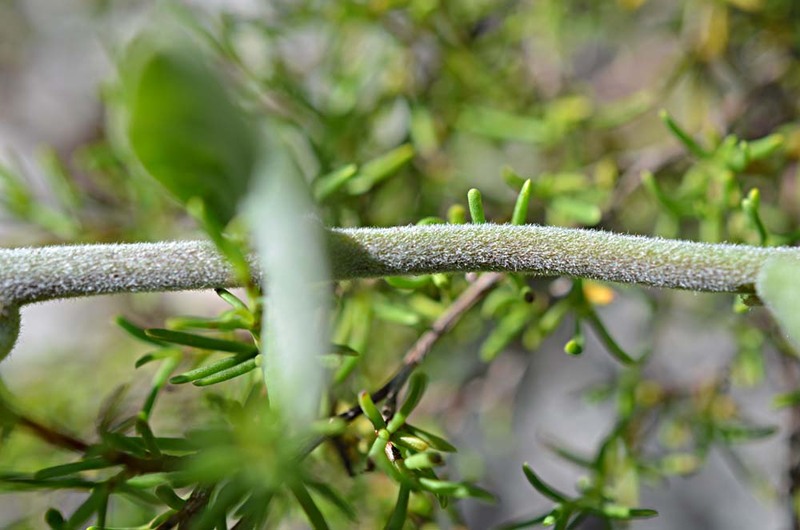 When I first posted this, I labeled it as C. ornata. 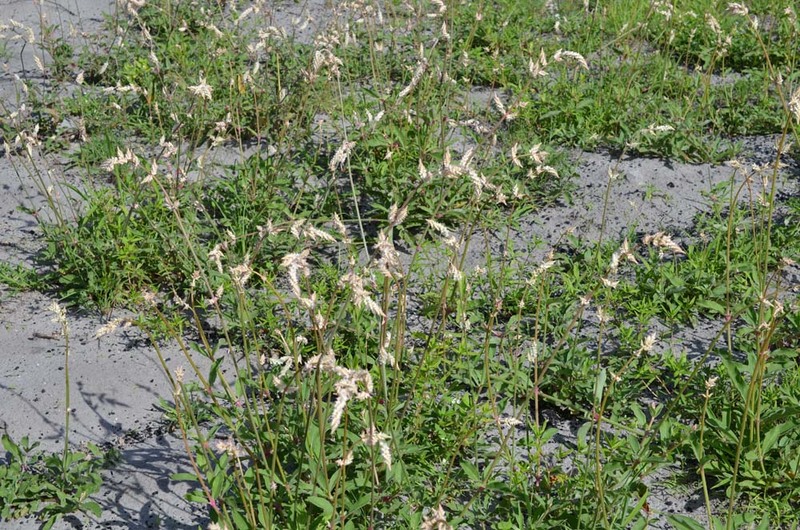 However, I now believe it is C. graminea (7/23/12). 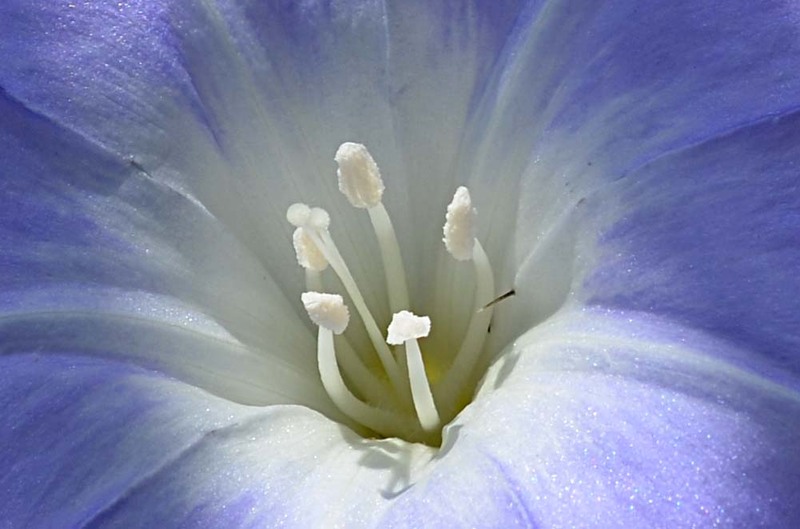 Clues: It was growing in a clump and the leaves extended above the flower stalks. 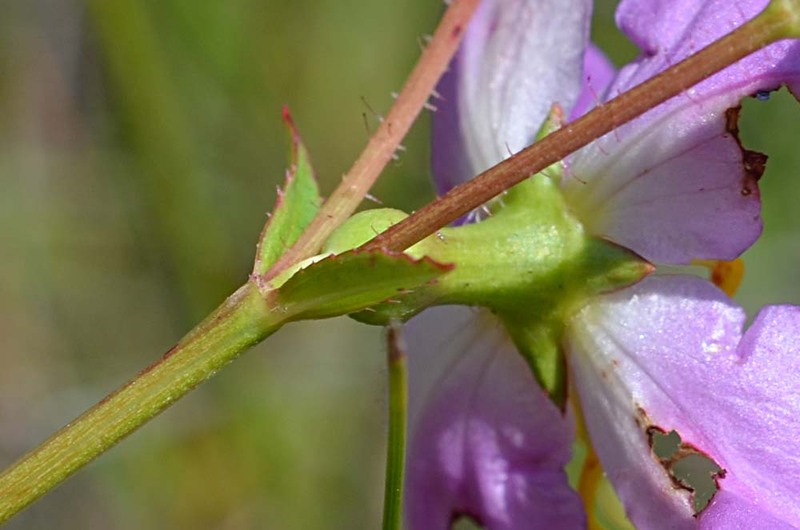 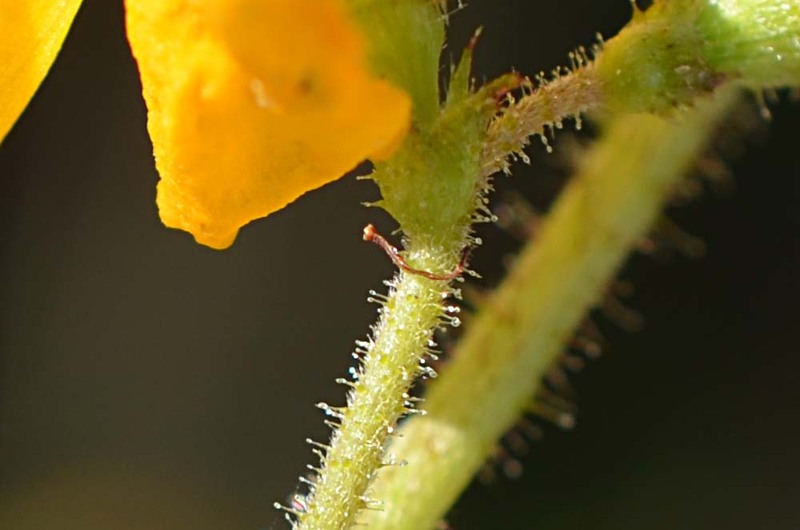 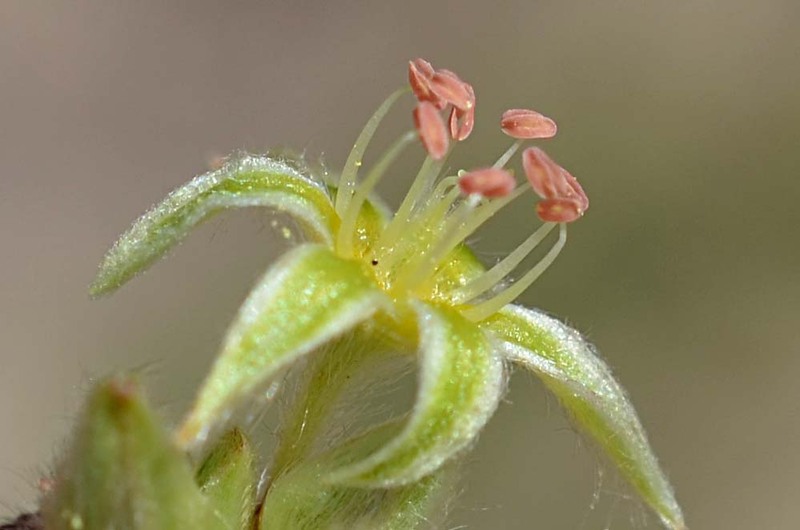 Like roselings, spiderworts also have beaded hairs attached to the filaments. 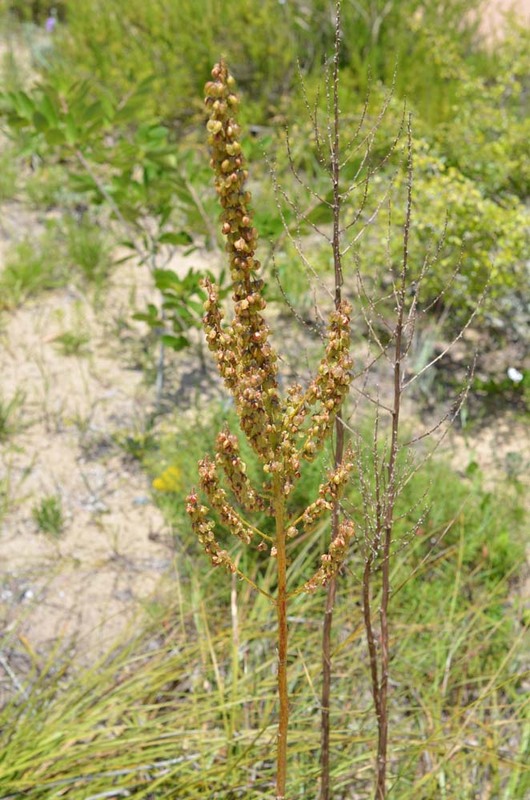 An abundant plant in this area. 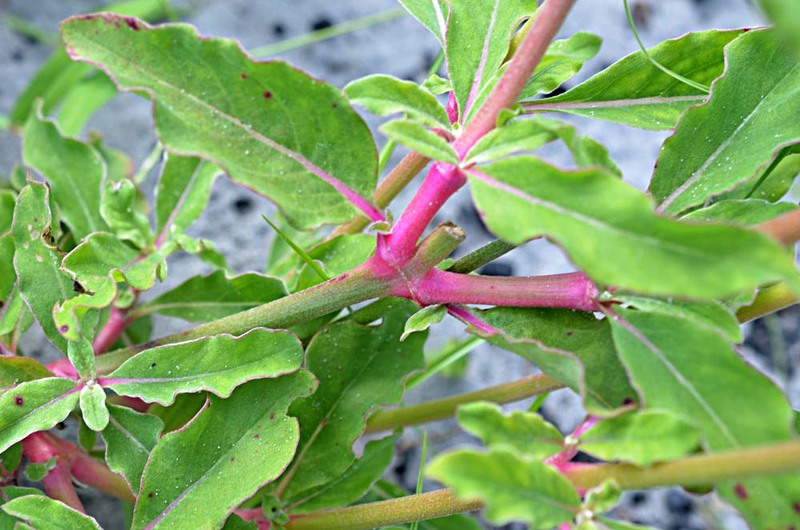 The joints are frequently tinged with red. 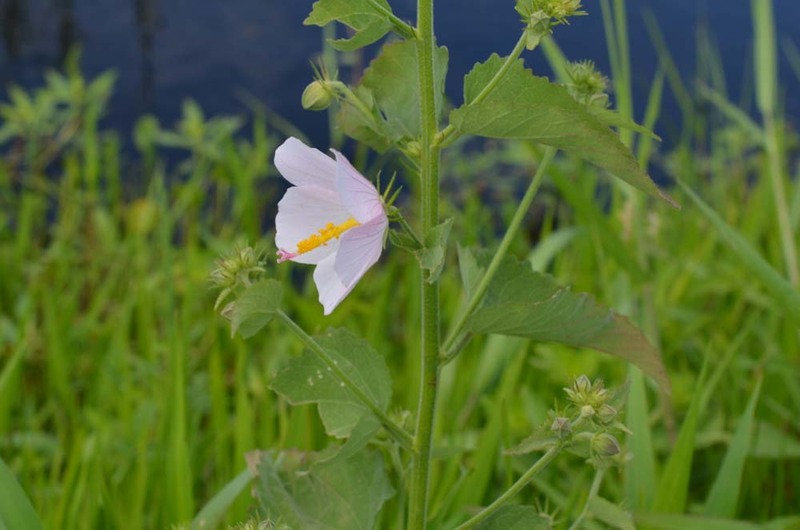 This is a very common, spreading, roadside weed. 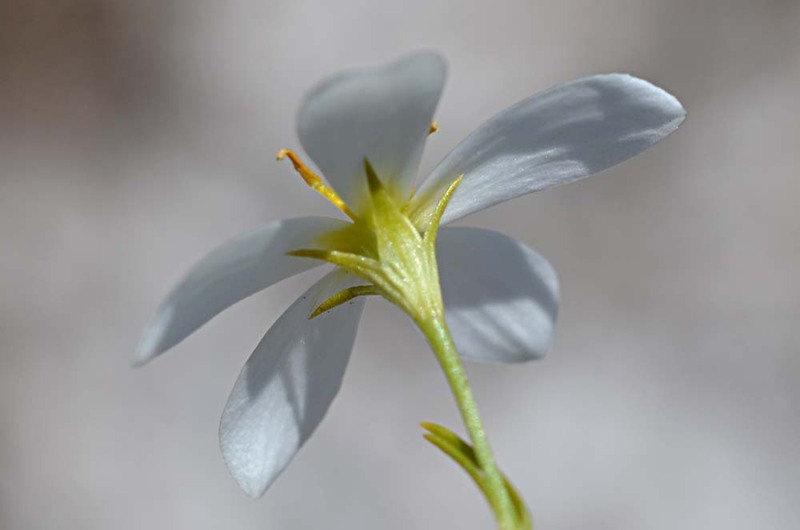 It's a relative of the showier Mexican Clover (R. grandiflora). 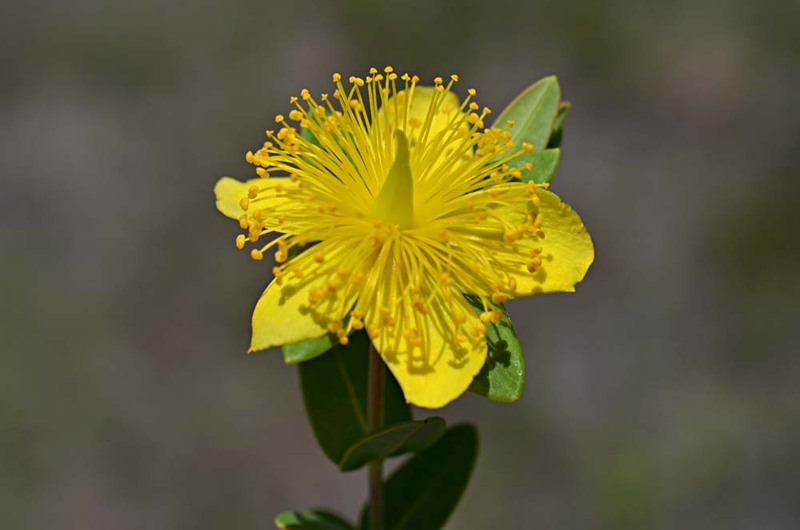 This plant is shown on the kiosk at Hickory Lake Scrub as being one of the rare plants found there; however, I've never seen it there. 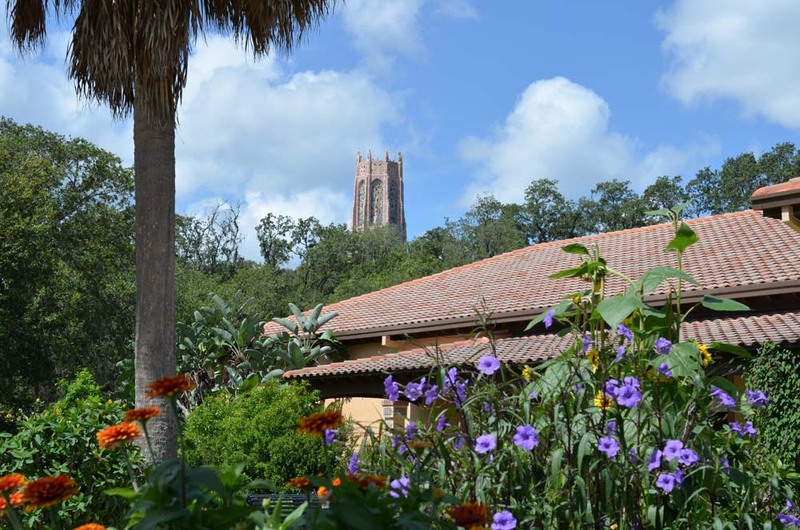 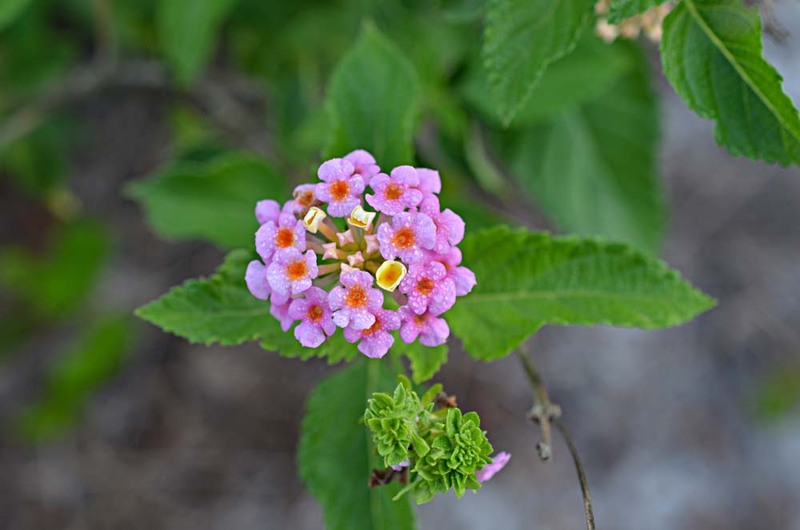 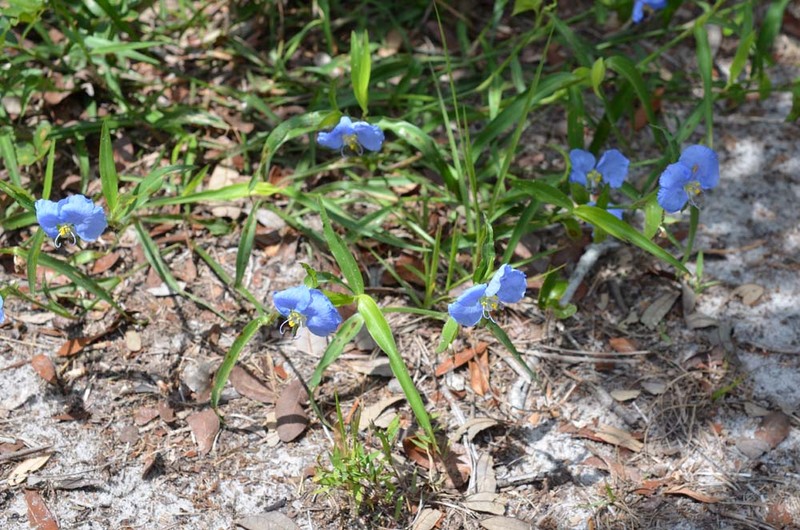 Several of them were growing in the native plant garden at Bok Tower Gardens. 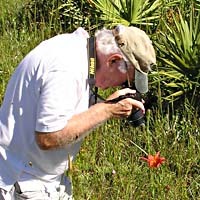 A lady bug nymph can be seen to the left of center. 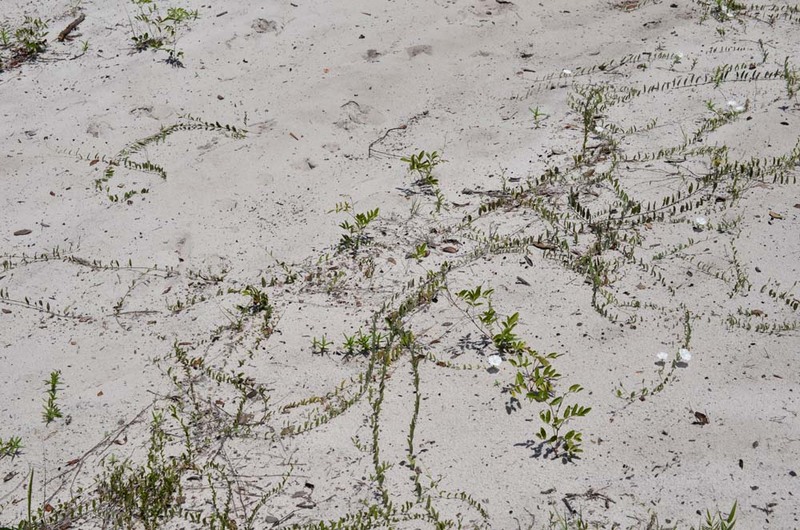 And lastly, some critters found along the way. 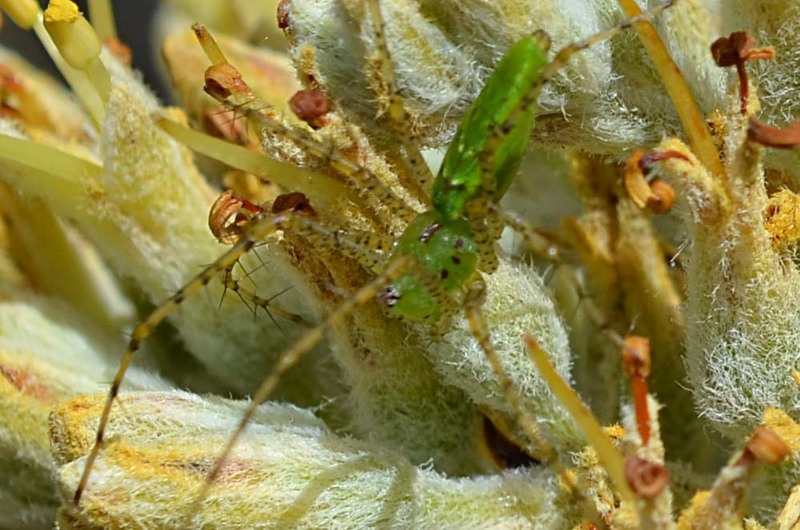 A predatory insect. 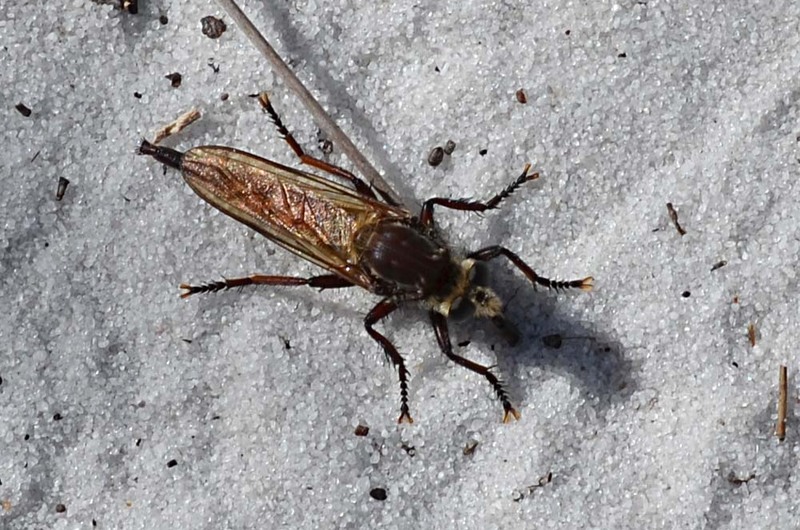 Frequently goes after insects larger than itself. 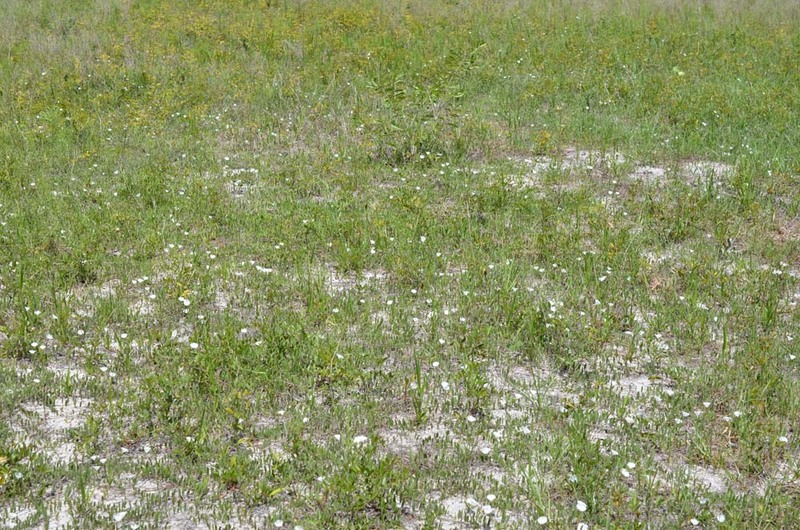 Sometimes, sits patiently on the ground, as this one did, while waiting for prey to come near. 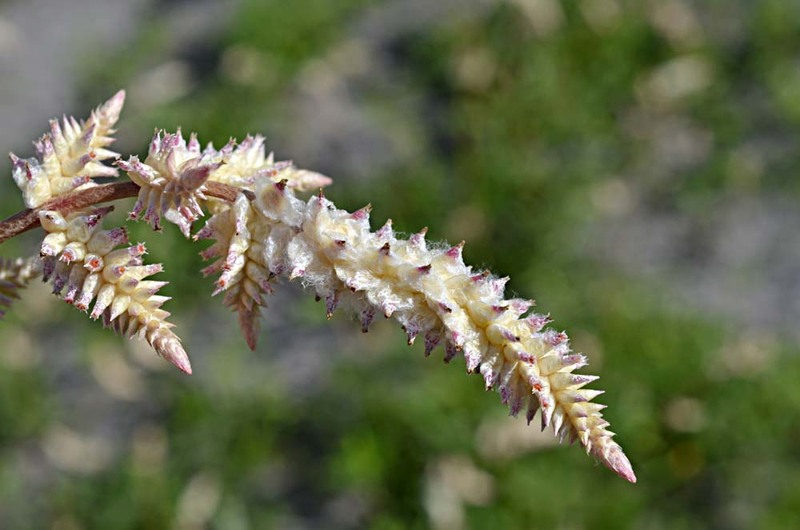 Doesn't bother people, but can inflict a painful bite if handled roughly. 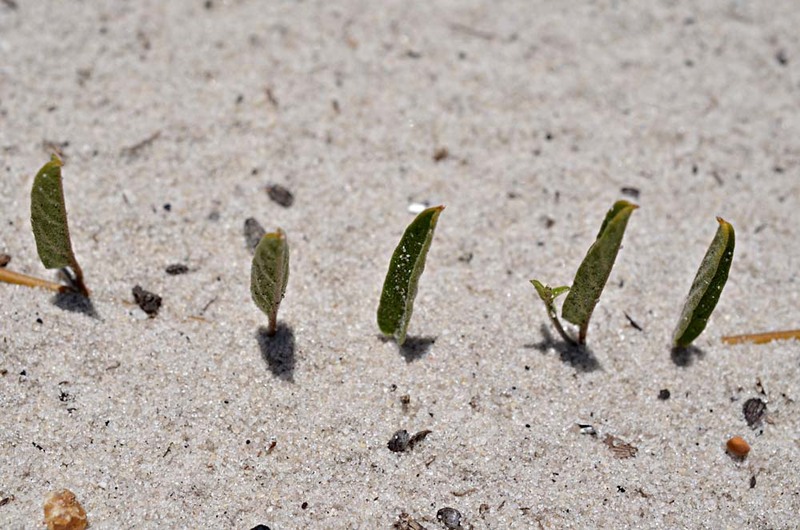 Left: on redroot; right: on alicia. 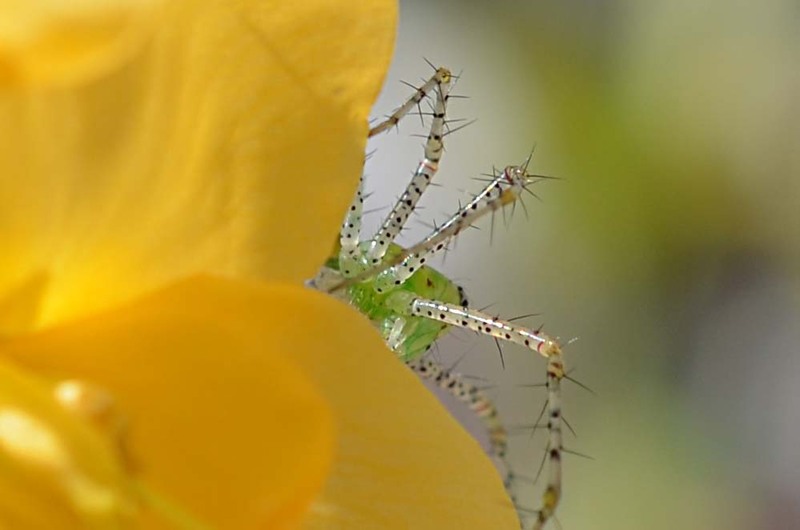 Lynx spiders are hunting spiders that chase their prey over vegetation or lie in wait and leap out. 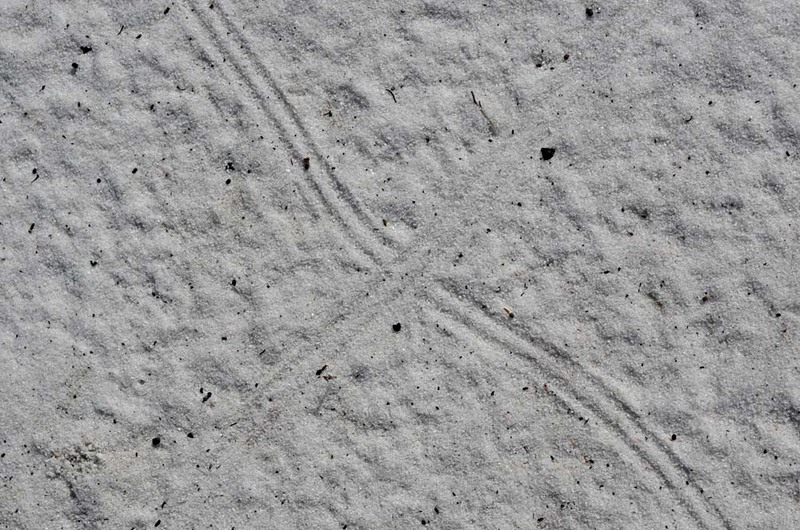 The open, white sand provides a good record of the previous night's activities--if you know how to read the tracks.